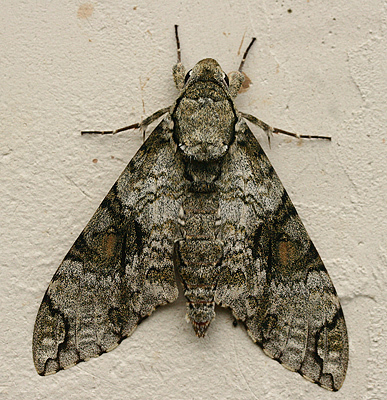 Manduca vestalis (Jordan, 1917). 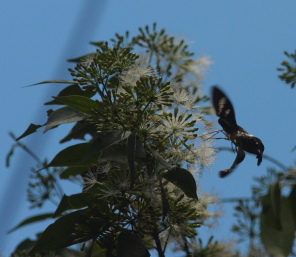 Caranavi, Yungas, Bolivia February 12, 2016. Photographer; Peter Møllmann. Idification by Jean Haxaire on facebook. 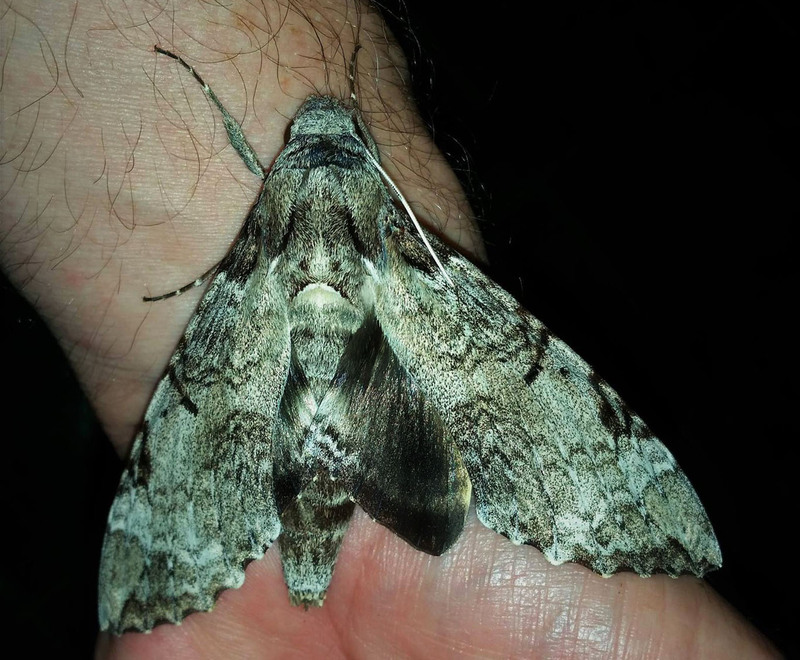 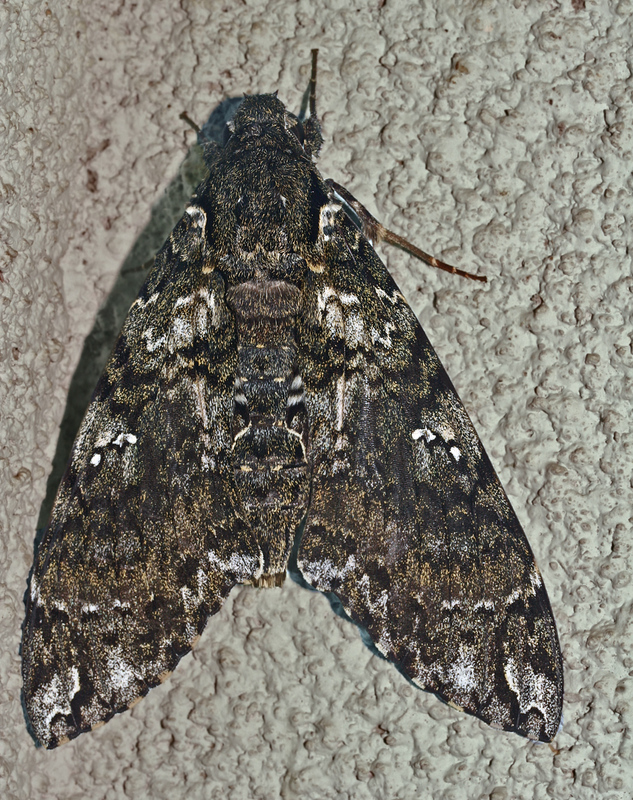 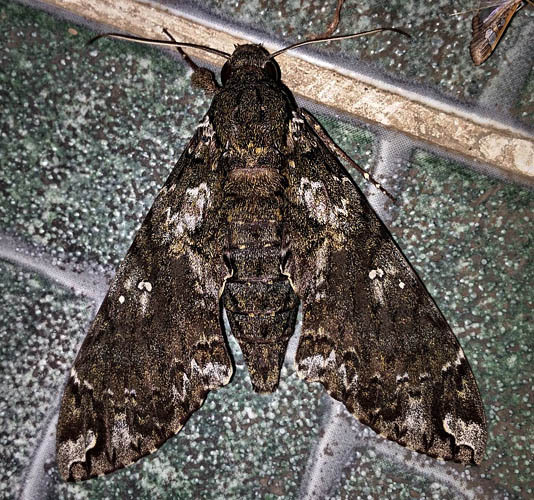 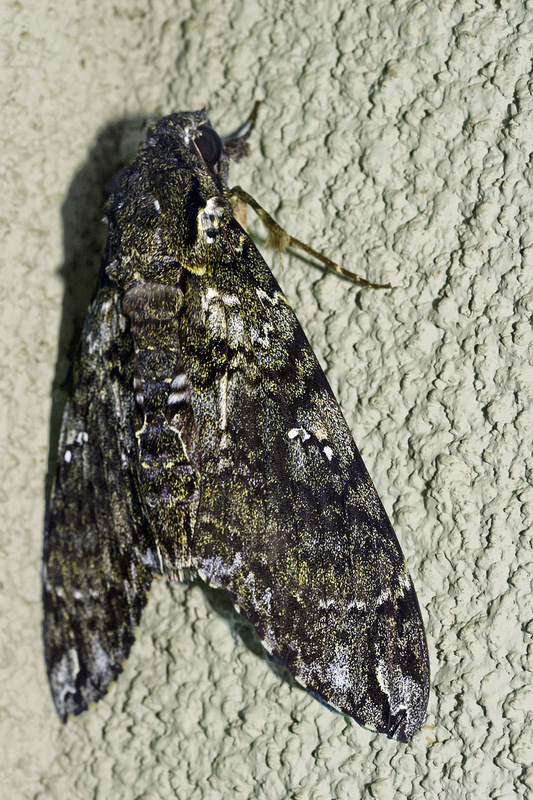 Manduca neglecta? 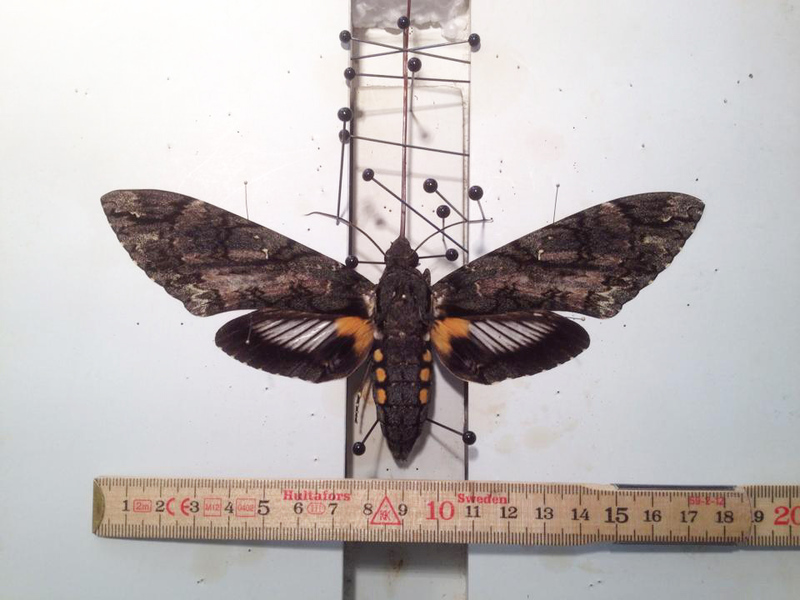 Manduca florestan Manduca florestan. Manduca albiplaga. 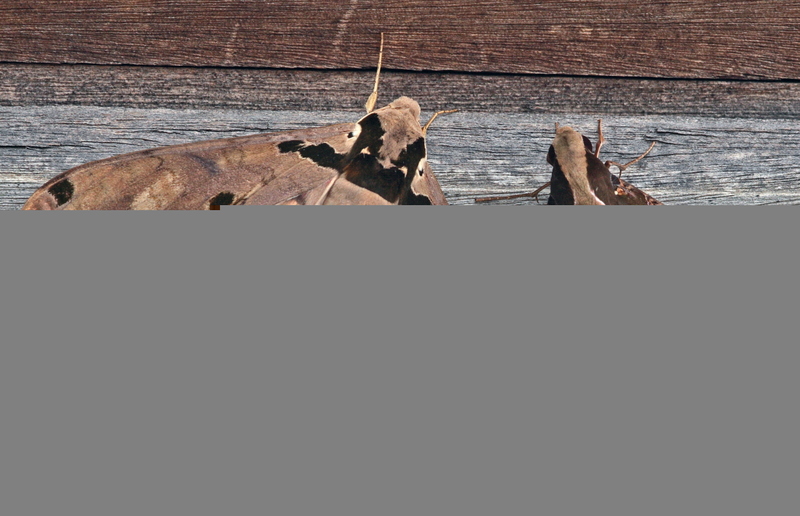 (Jean Haxaire and Thierry Vaglia, 2006 ). (Stohl, 1782). (Stohl, 1782). 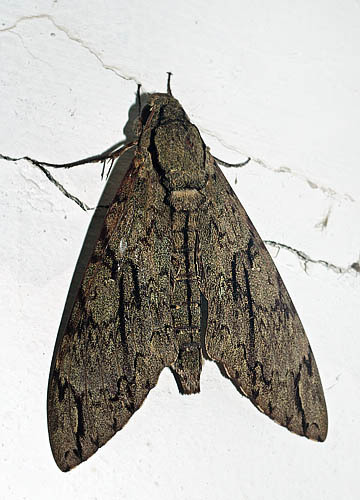 (Poey, 1832). 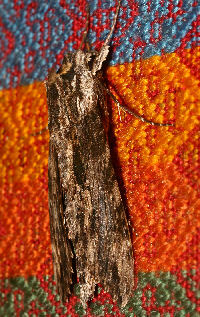 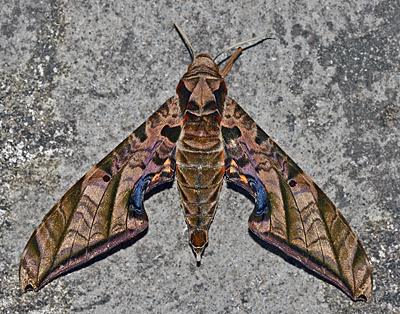 Tetrio Sphinx Moth, Pseudosphinx tetrio (Linnaeus, 1771). 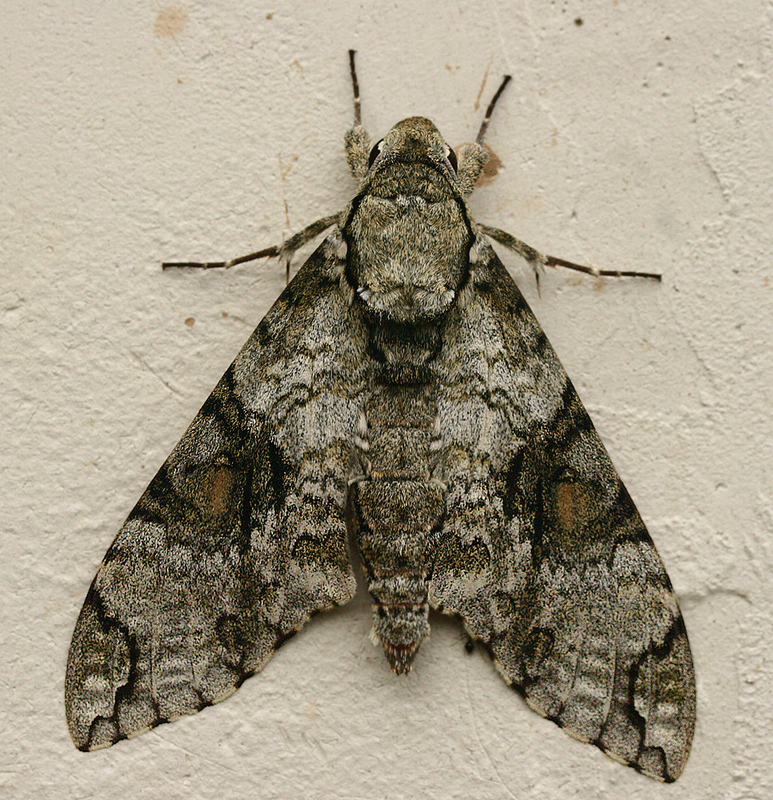 Rustic Sphinx, Manduca rustica (Fabricius, 1775). Consata, Yungas, Bolivia February 21, 2016. 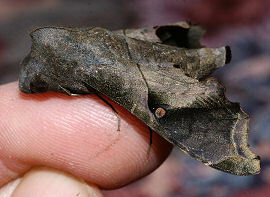 Photographer; Peter Møllmann. 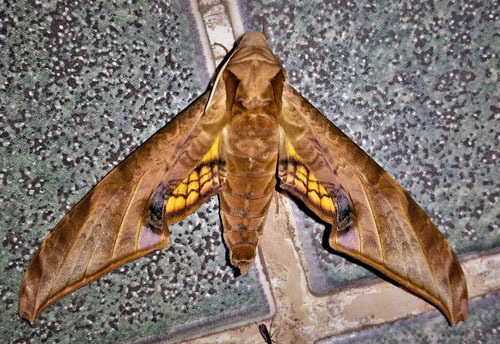 Idification by Dominik Hofer on facebook. 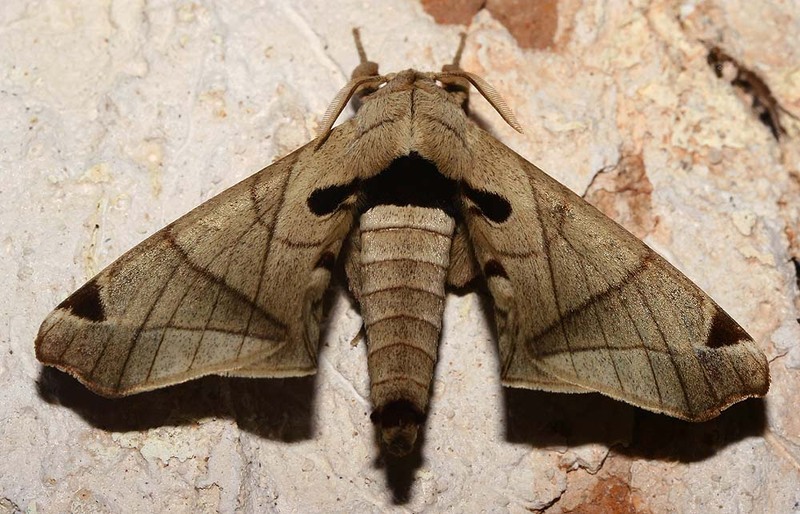 (Linnaeus, 1764). 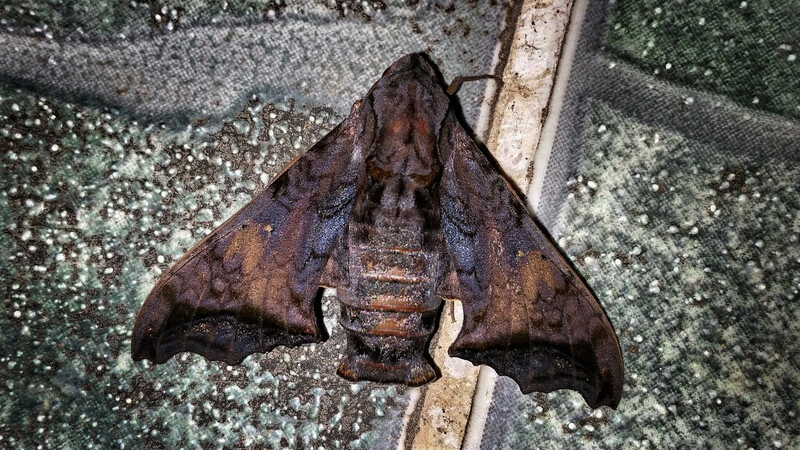 (Rothschild and Jordan, 1903). 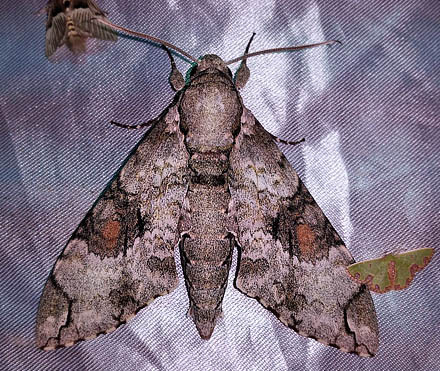 (Boisduval, 1875). 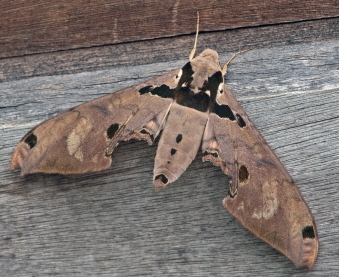 (Boisduval, 1875). 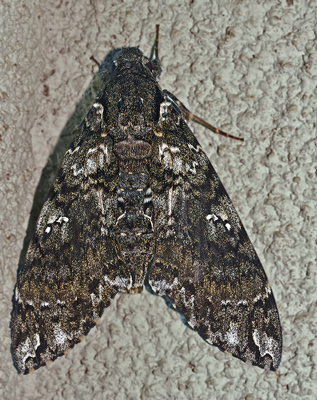 (Rothschild and Jordan, 1910). (Poey, 1832). 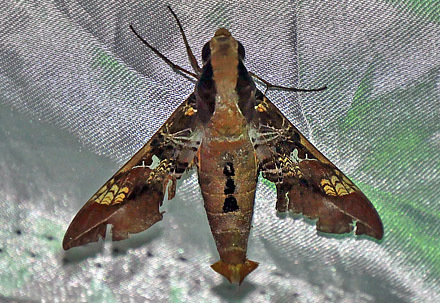 (Poey, 1832). 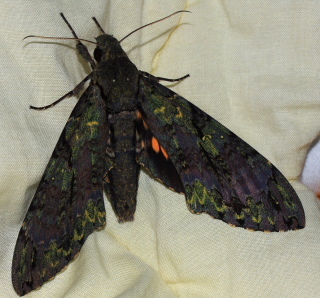 (Poey, 1832). 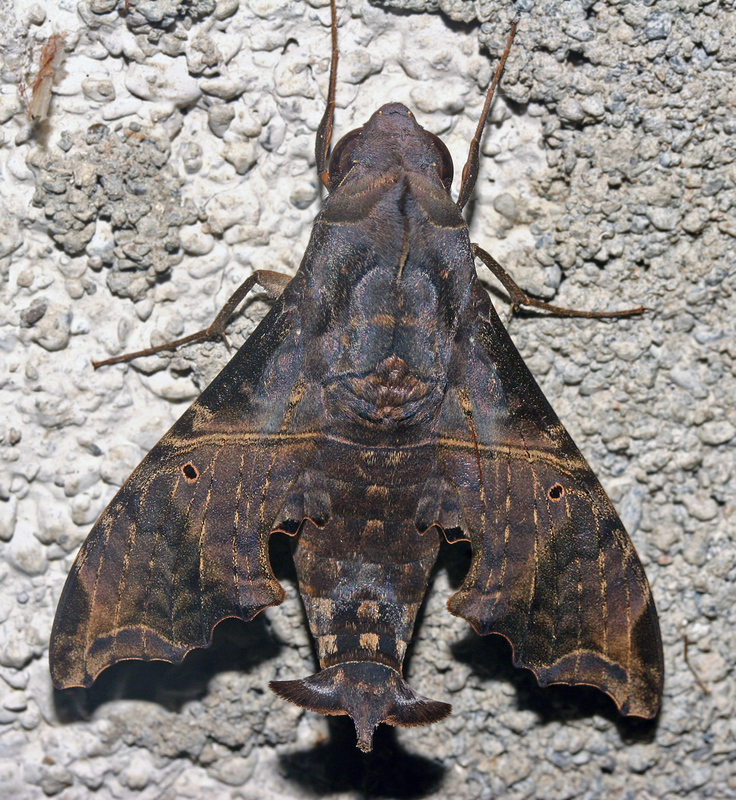 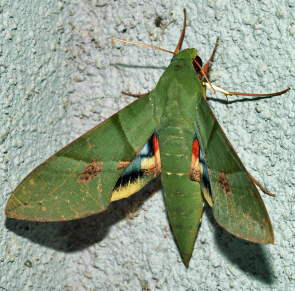 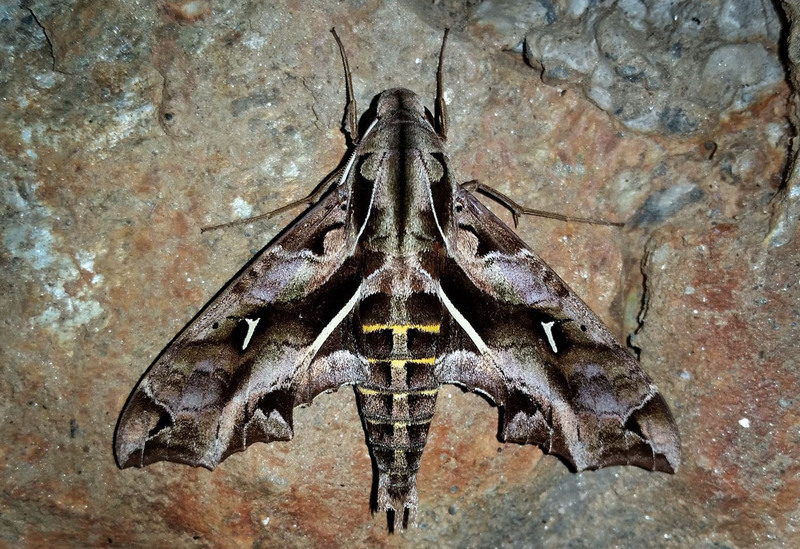 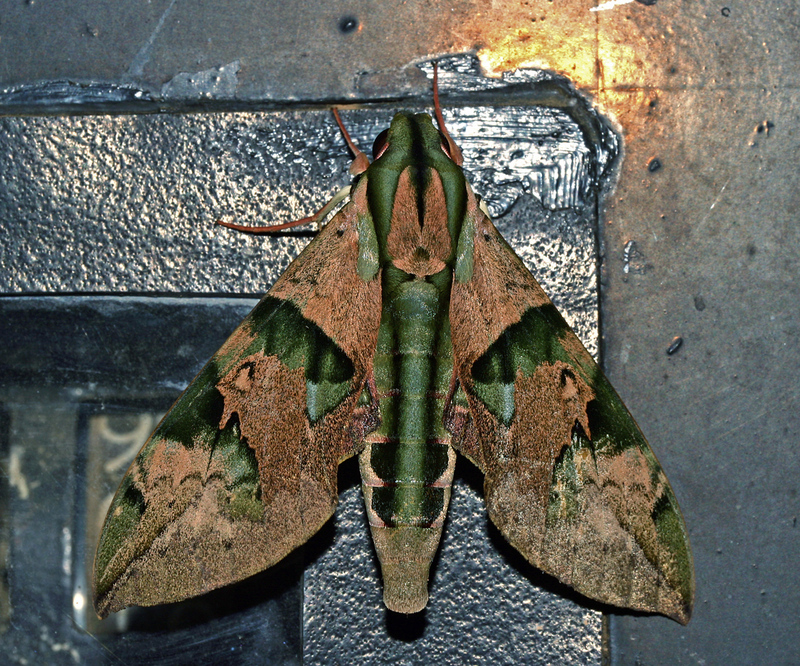 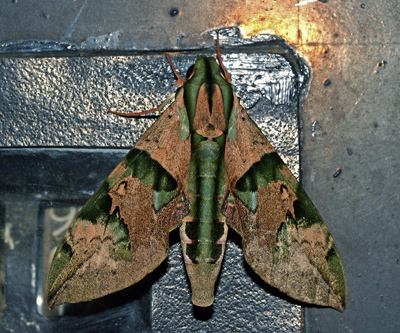 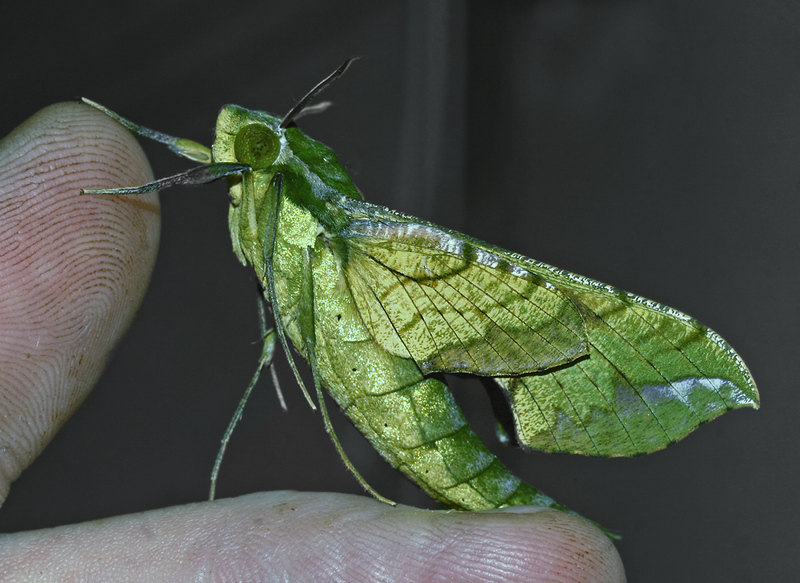 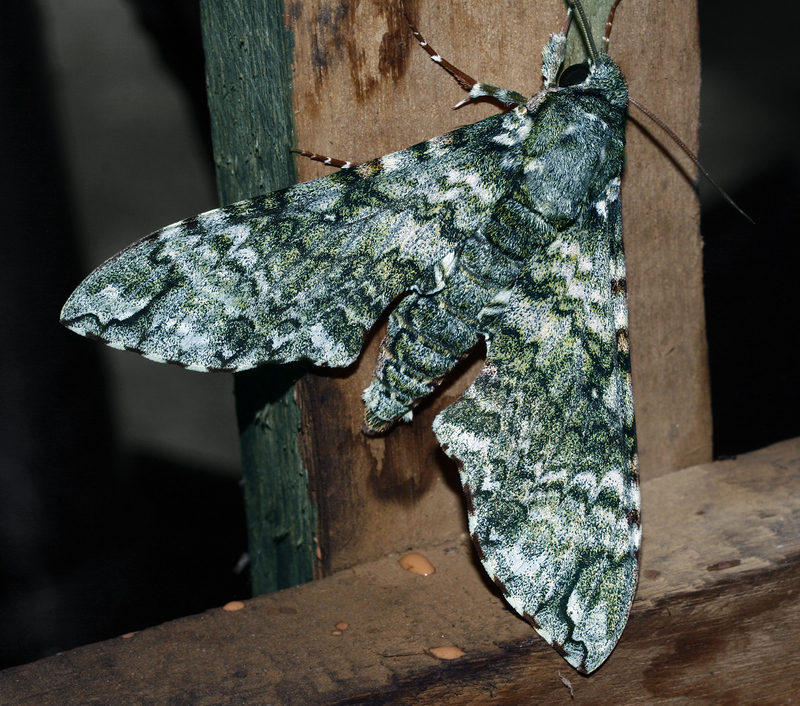 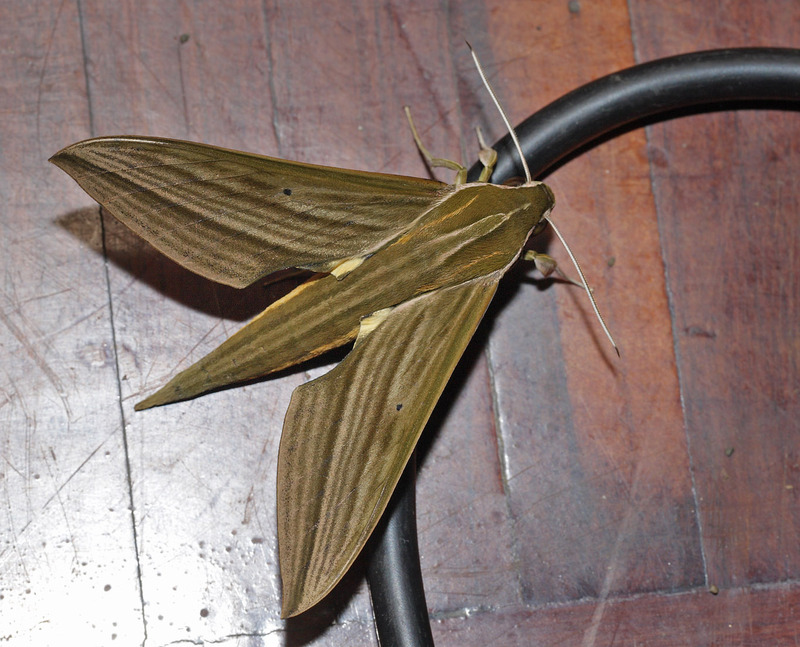 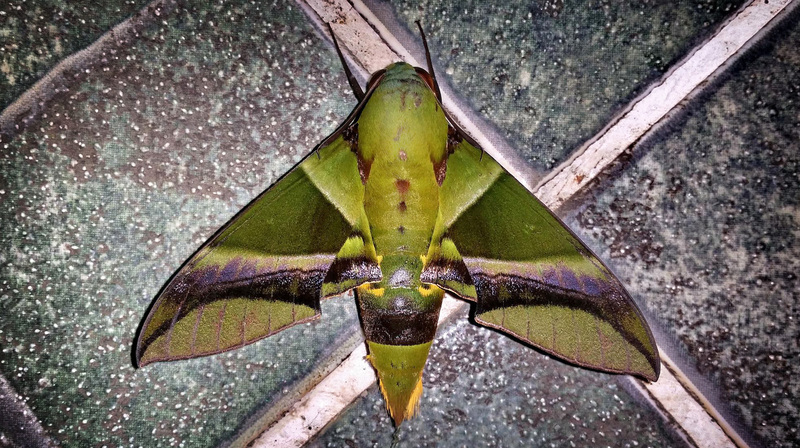 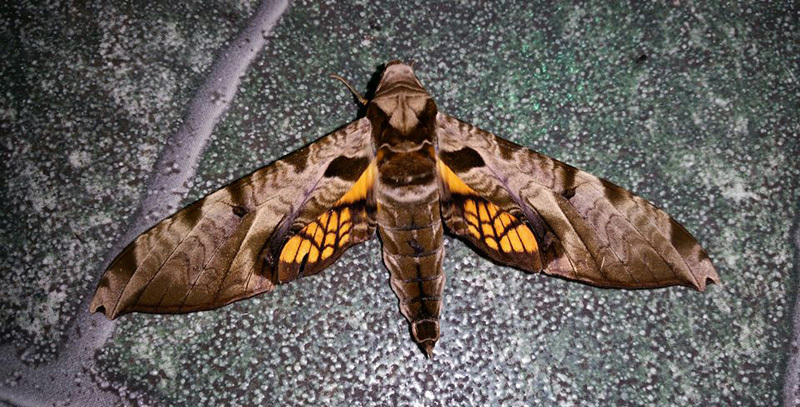 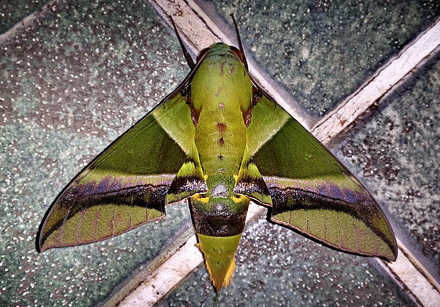 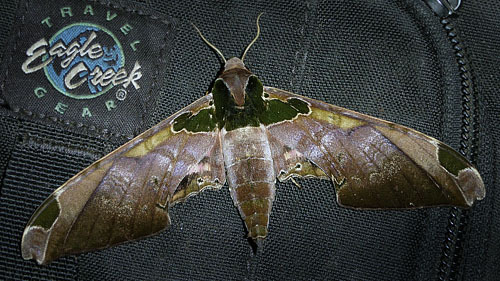 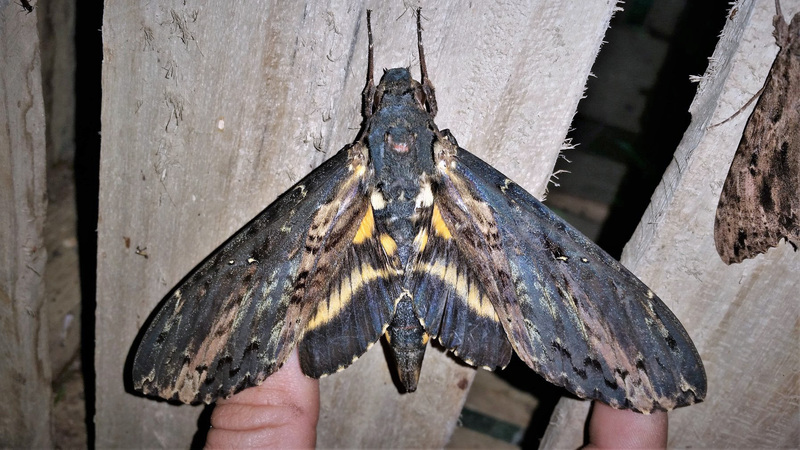 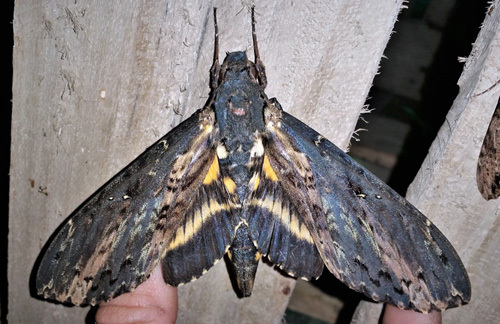 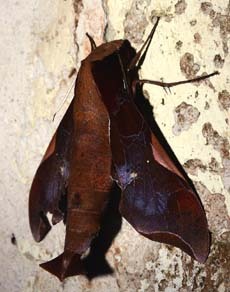 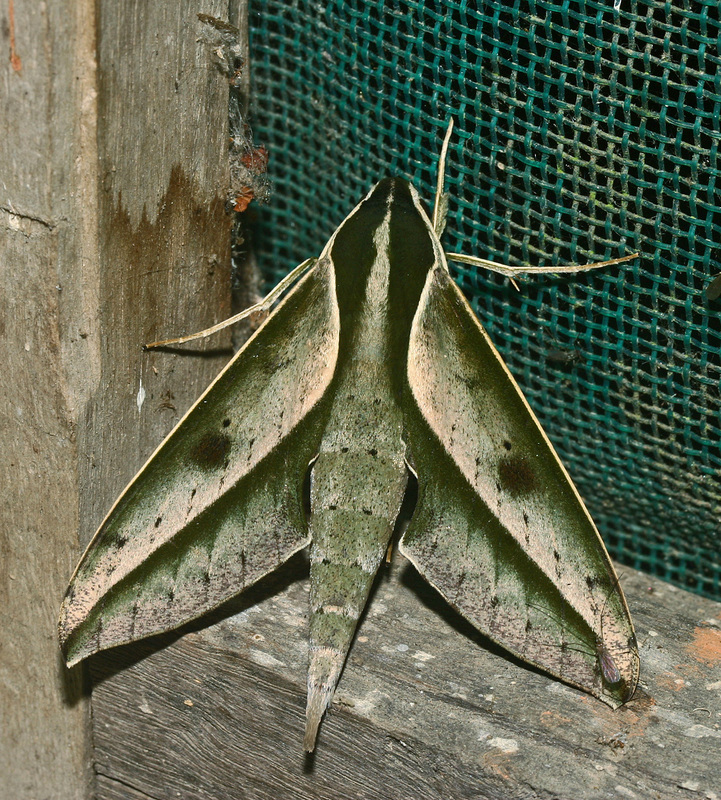 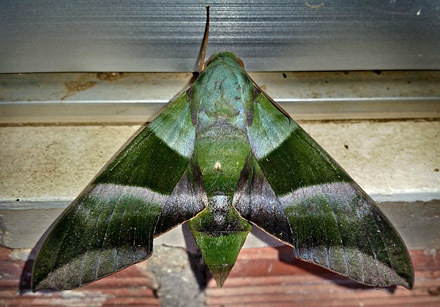 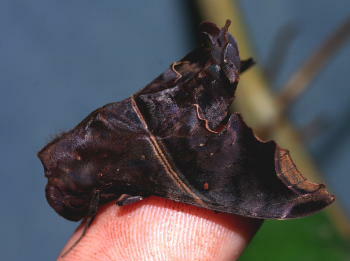 Here one of the largest Hawkmoths from hotel Esmeralda, Coroico, Yungas on 28 January 2007; Dupochel's Sphinx, Amphonyx duponcheli. Photographer; Lars Andersen. 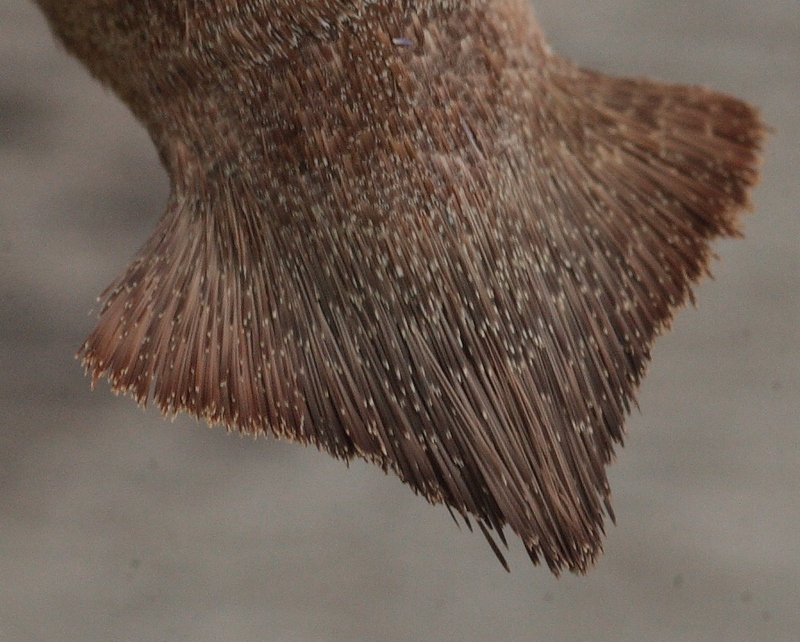 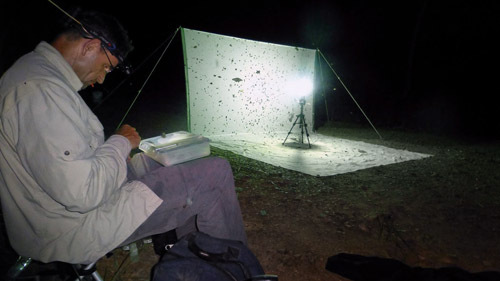 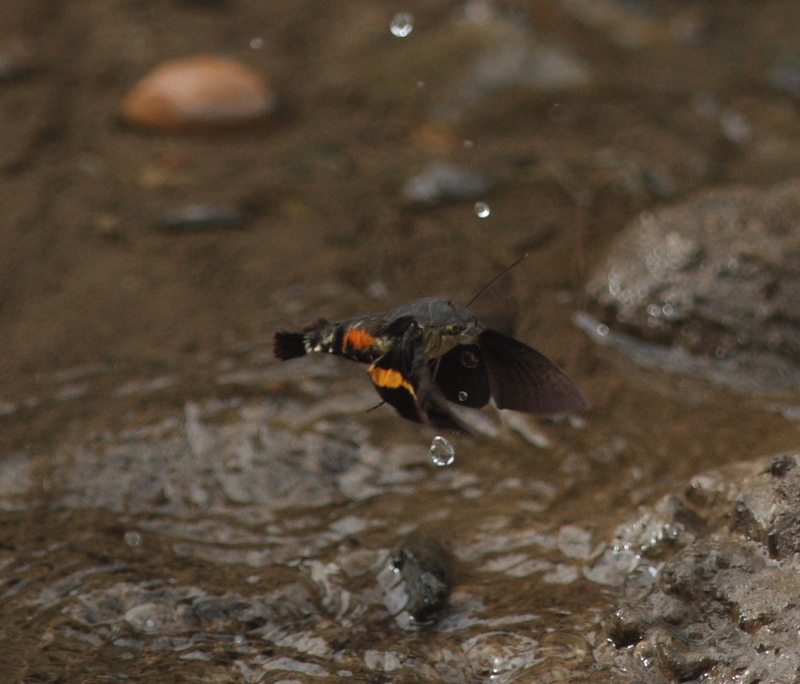 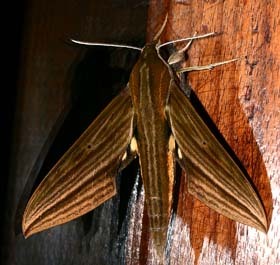 Measurements have been a female of 150 mm in wing span, their long Proboscis at 20 cm . 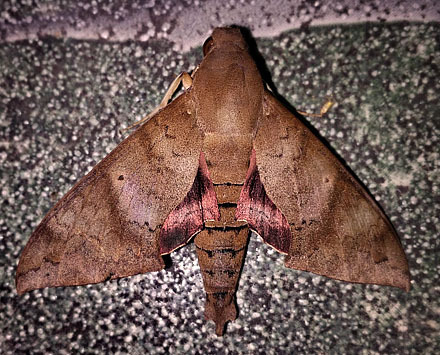 Here one of the world's largest Hawkmoths Giant Hawkmoths, Cocytius antaeus (Drury, 1773). 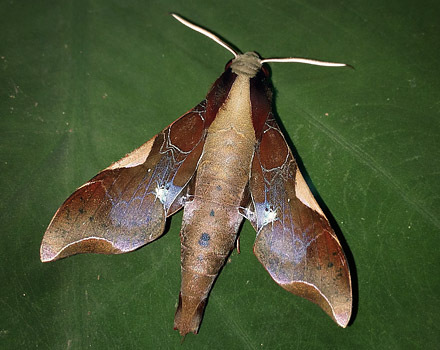 Measurements have been a female of 183 mm in wing span and is the heaviest butterfly in the world, their long Proboscis at 23-25 cm and sip nectar from flowers Angels Trumpet, Brugmansia species in twilight. 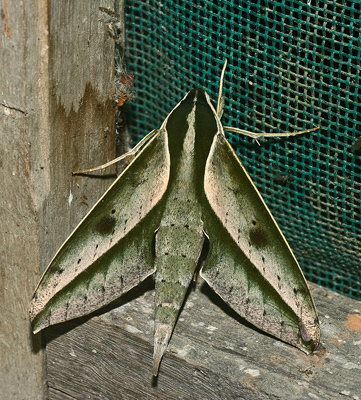 The caterpillars call hornworms living on tomato plants. 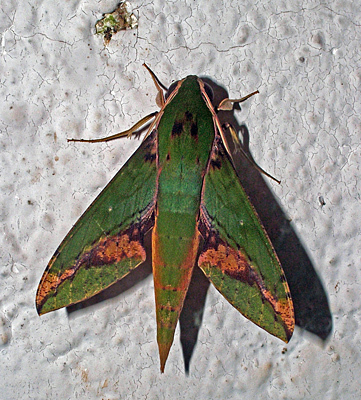 Distribution from Brazil to Texas. 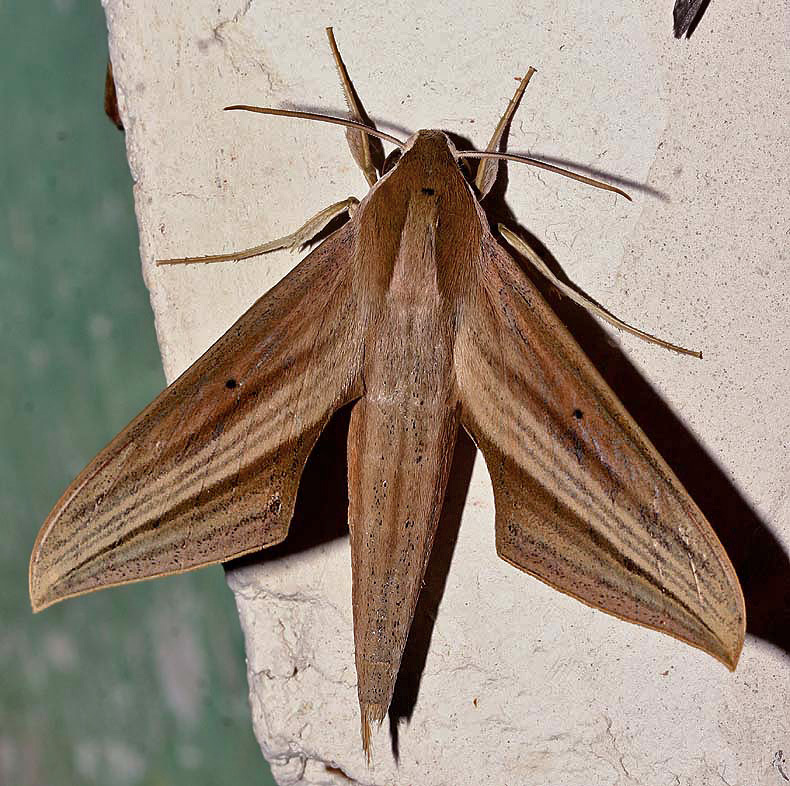 Long Proboscis Hawkmoth, Amphimoea walkeri (Boisduval, 1875). 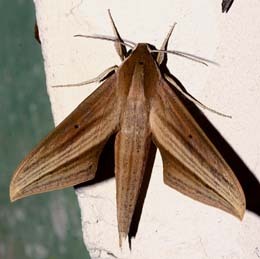 The wingspan is 147164 mm. 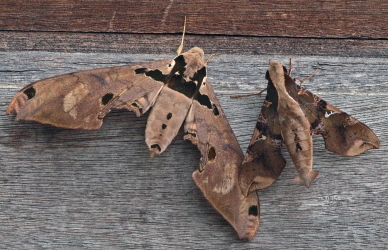 Adults are on wing year round. 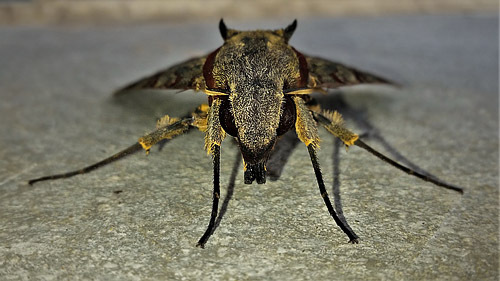 They have the longest insect proboscis in the world, and nectar from deep-throated flowers as Angel's Trumpet, Brugmansia arborea while hovering in the air. 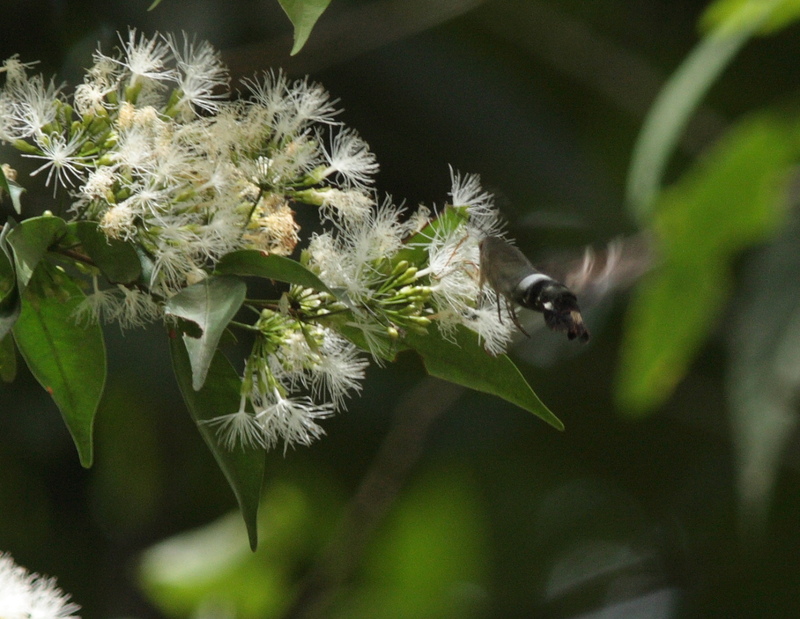 and probably other members of the Annonaceae family. 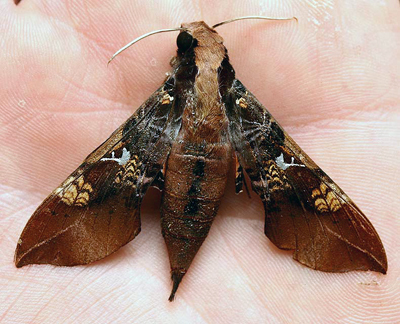 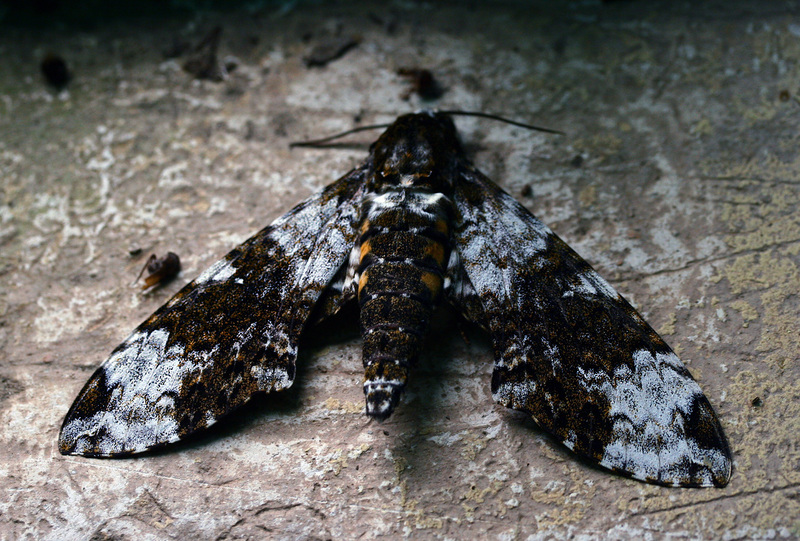 Dawins Hawkmoth, Xanthopan morganii praedicta (Rothschild & Jordan, 1903). 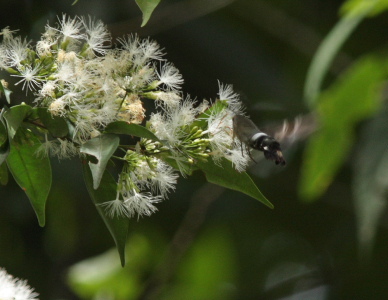 Named in honour of its predicted existence by Charles Darwin and Alfred Russel Wallace, exclusively pollinates the Madagascar Darwin's Orchid, Angraecum sesquipedale (Thouars, 1822). 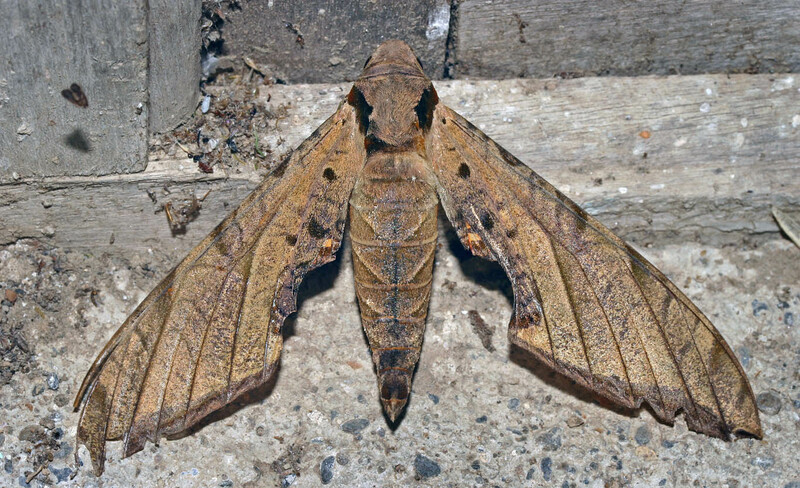 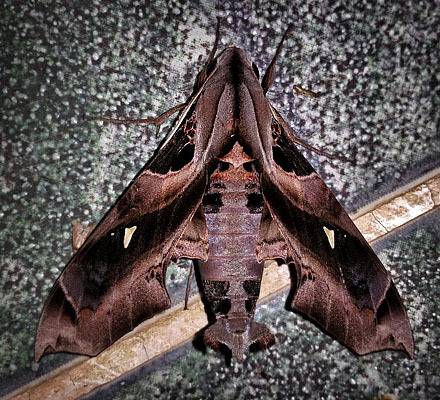 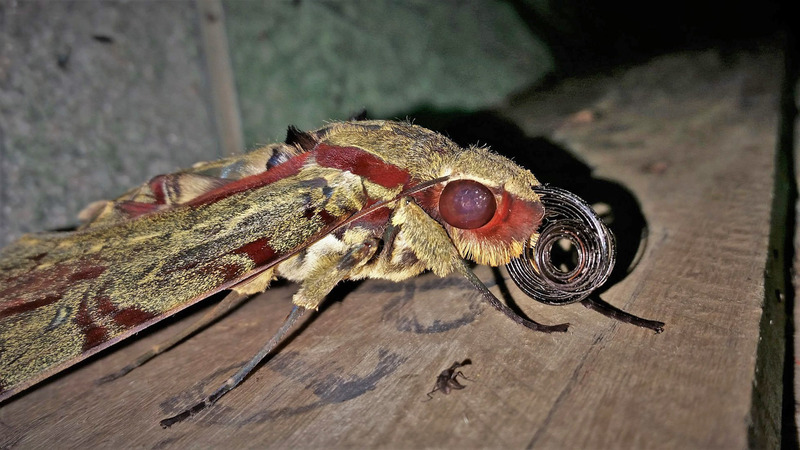 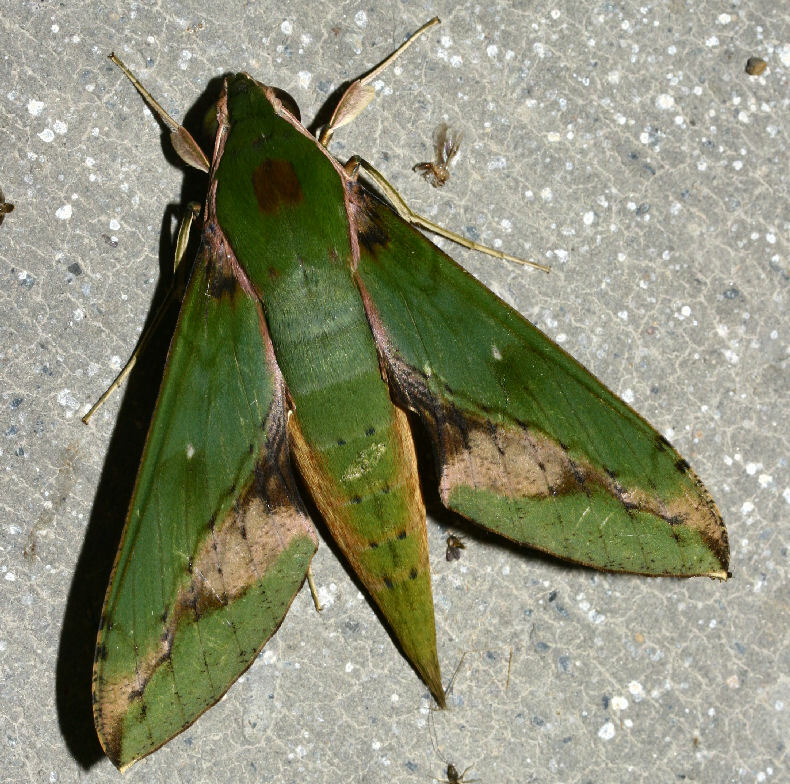 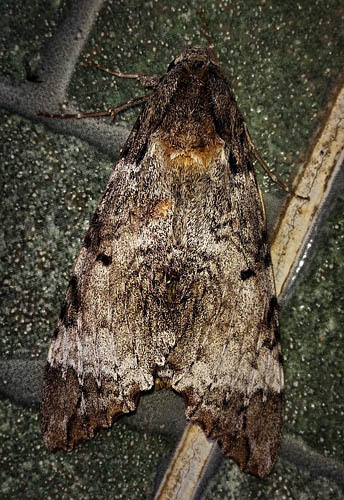 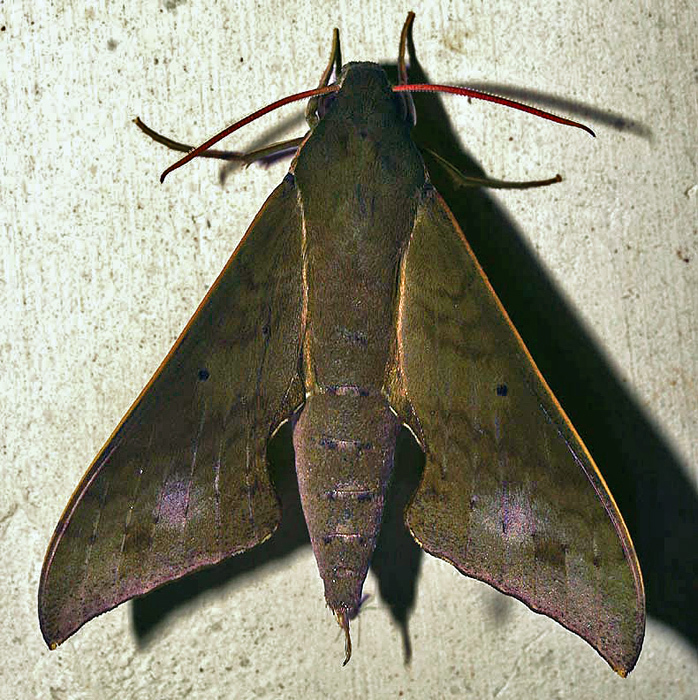 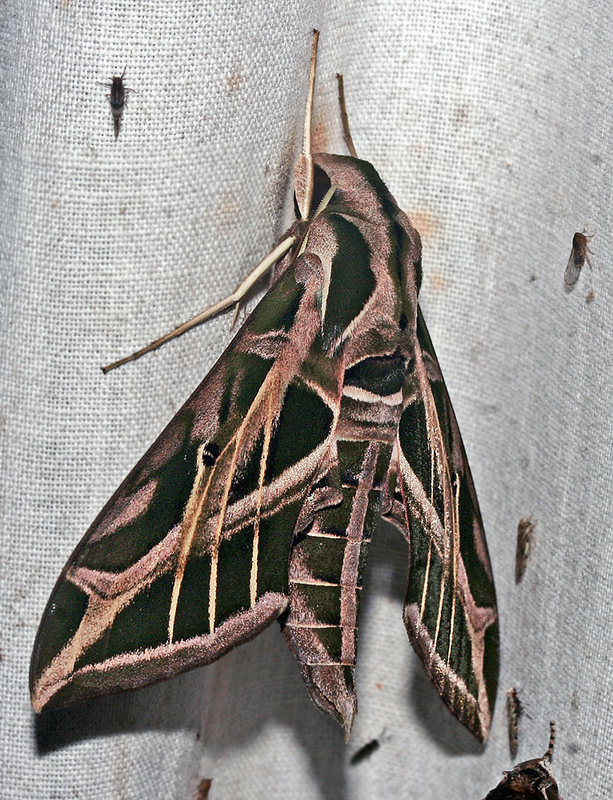 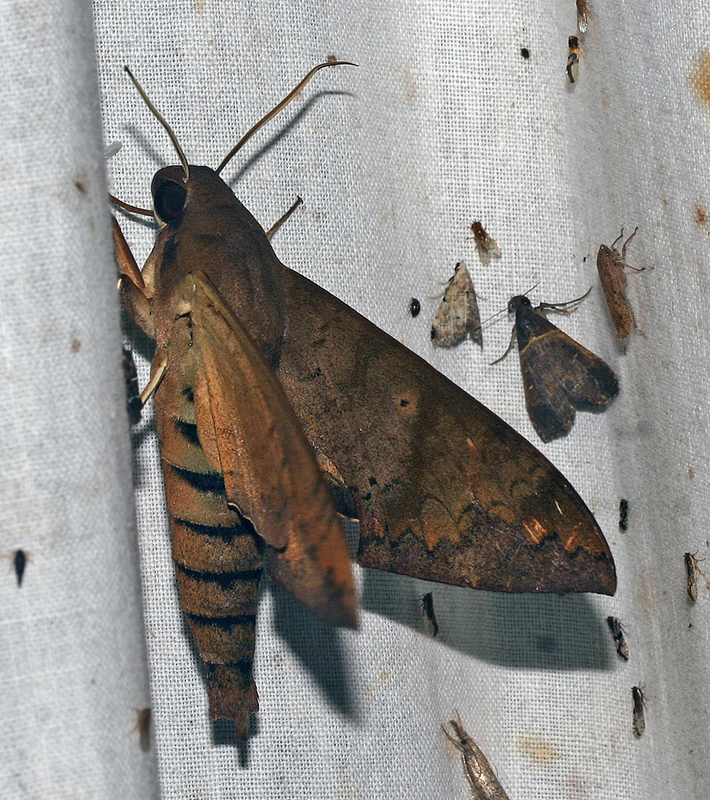 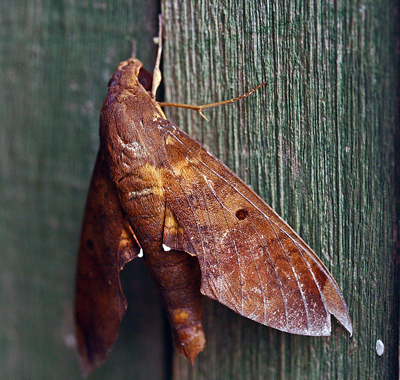 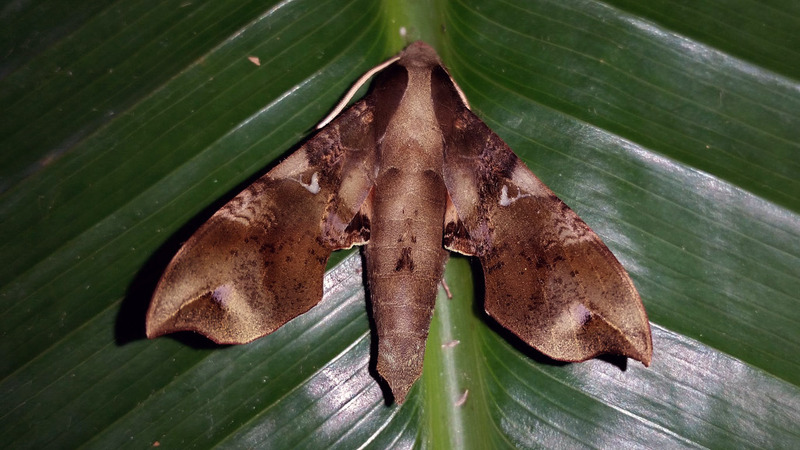 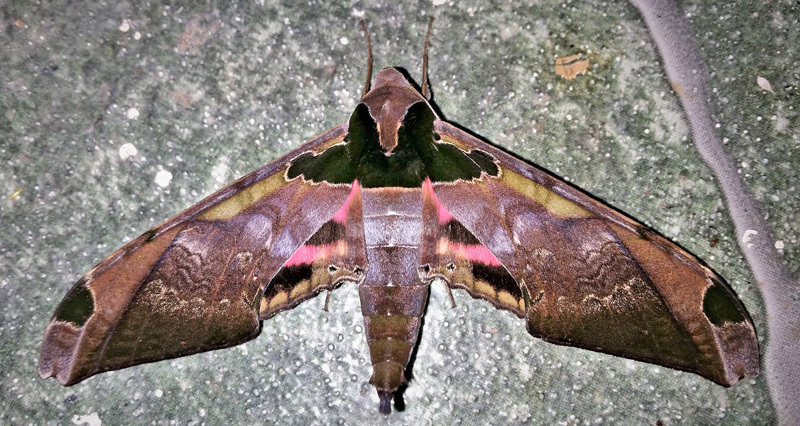 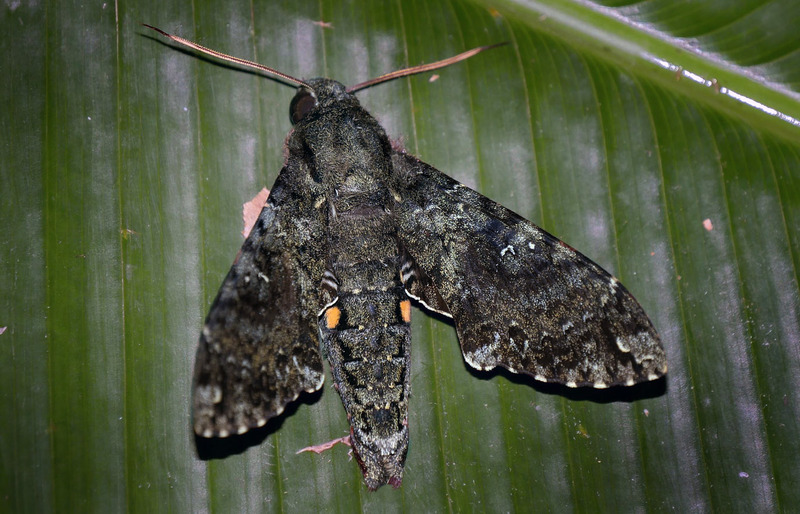 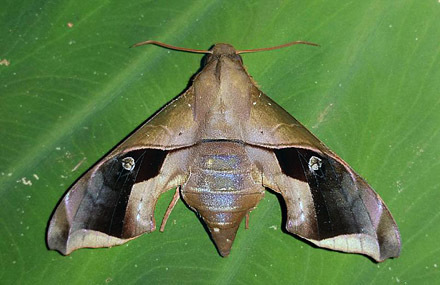 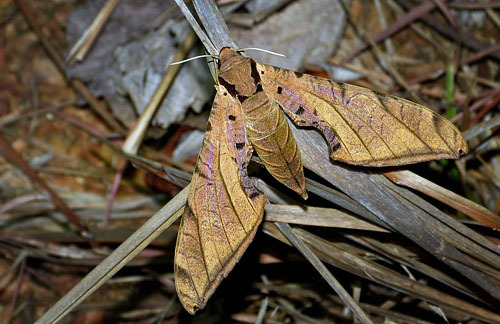 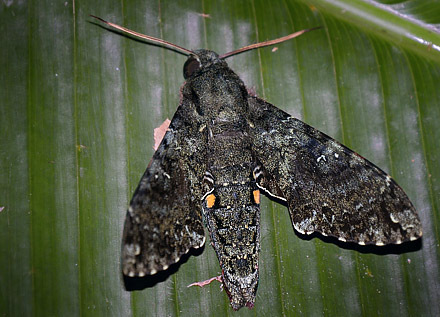 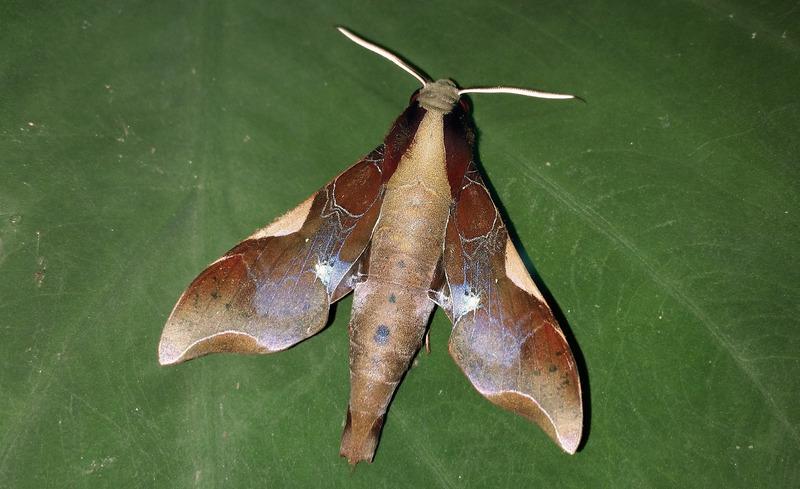 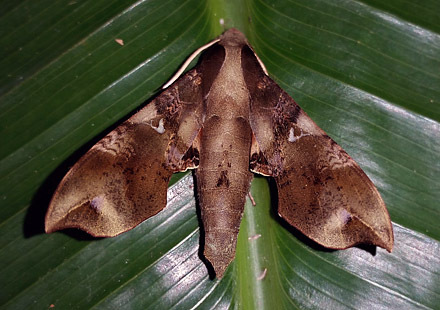 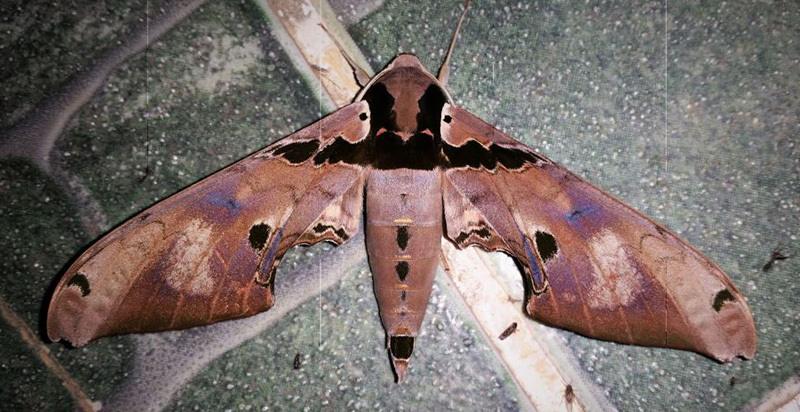 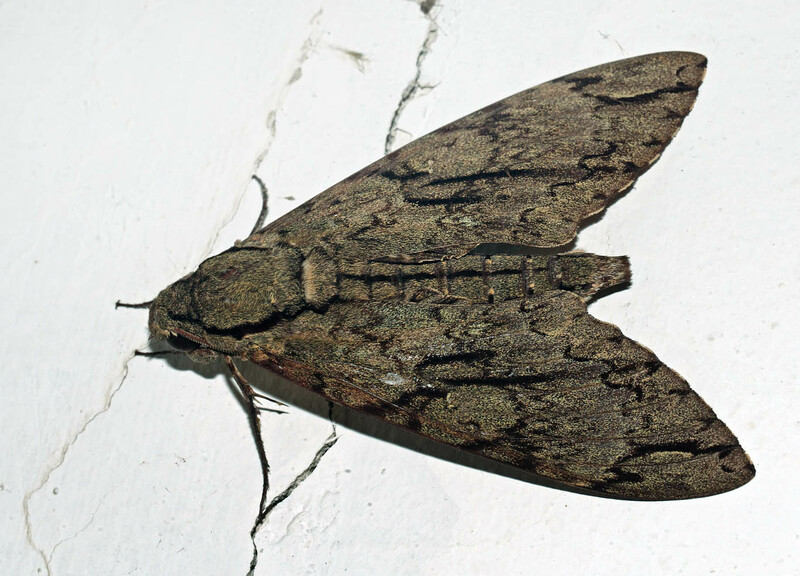 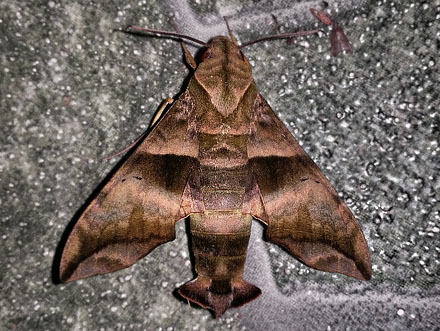 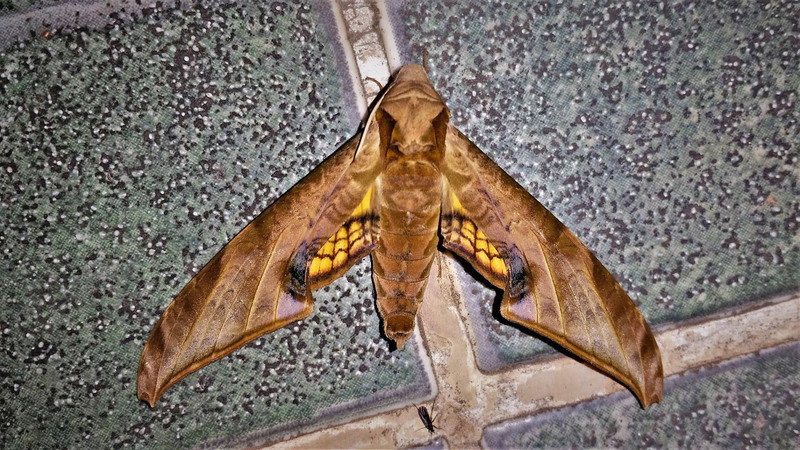 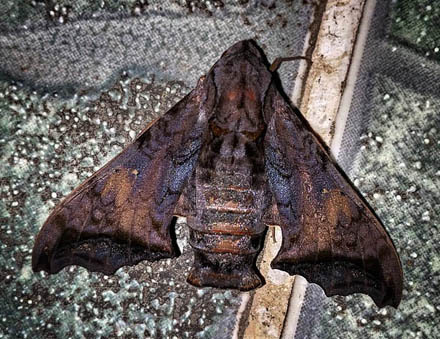 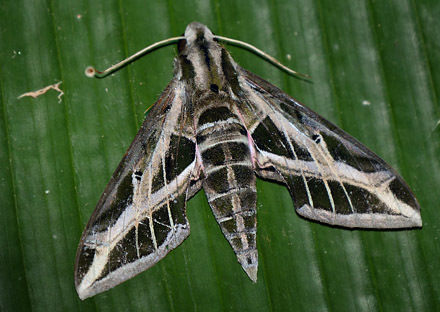 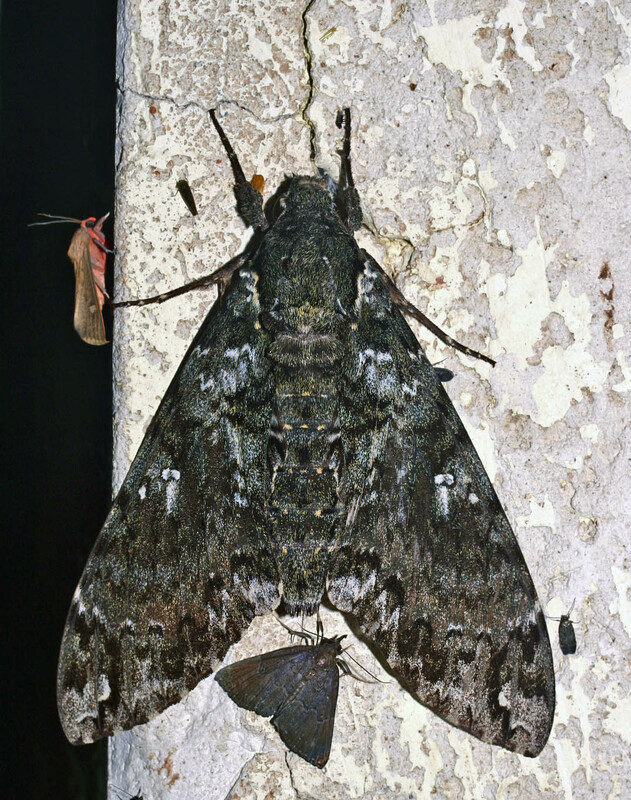 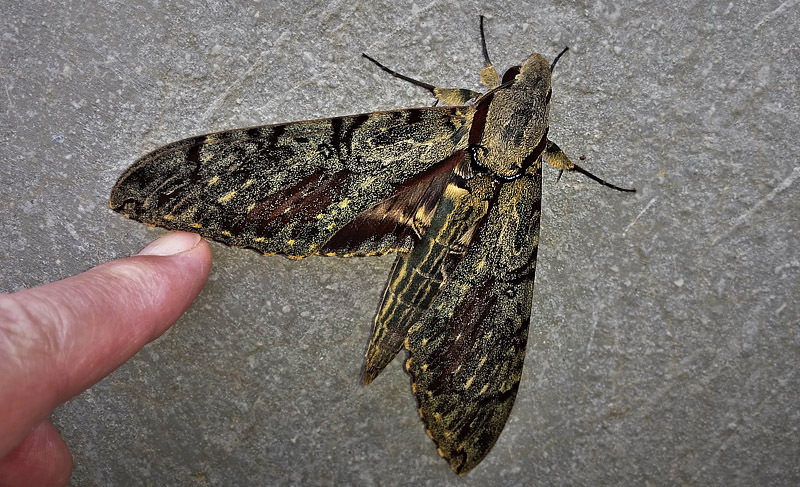 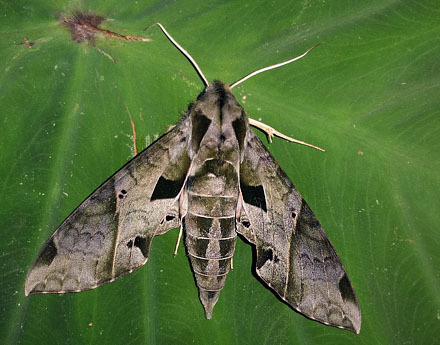 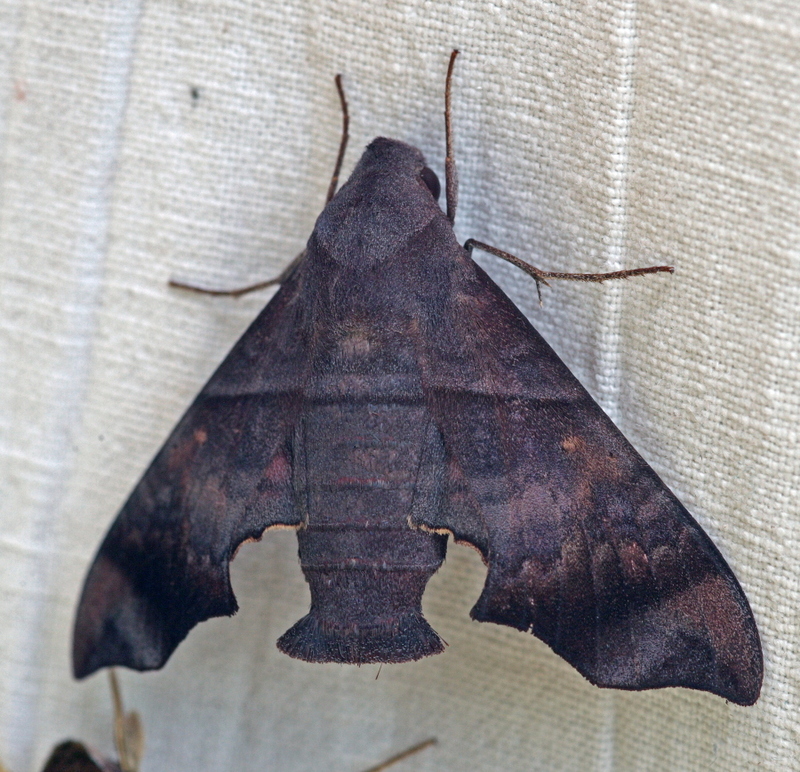 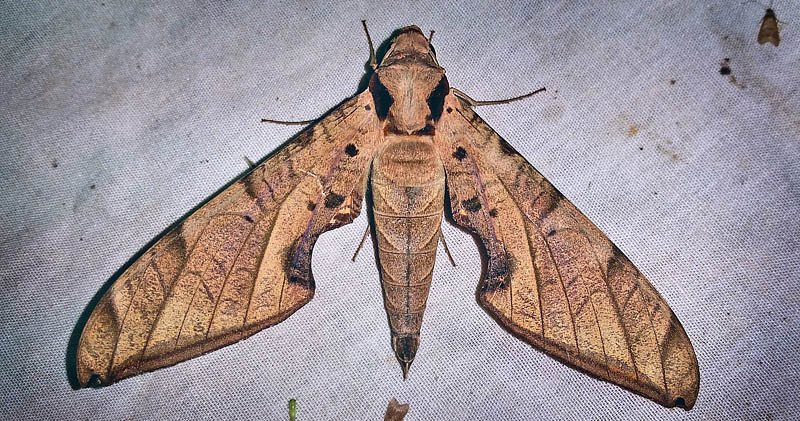 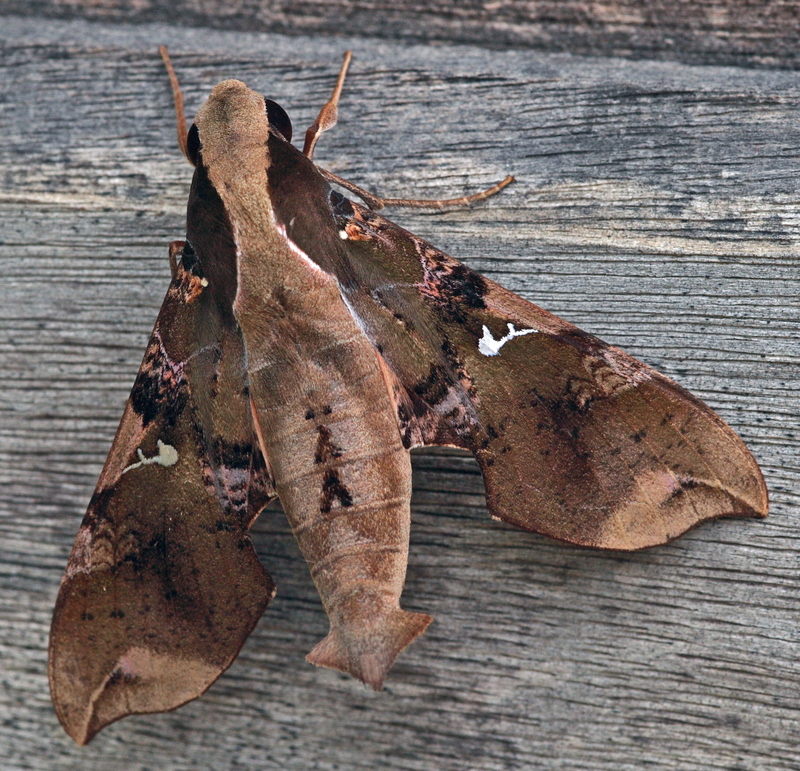 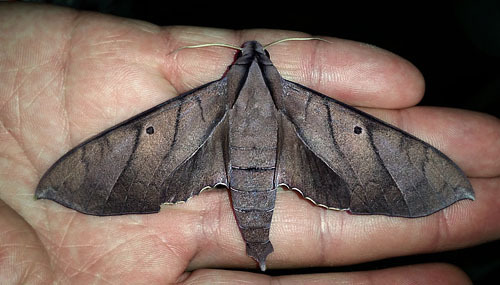 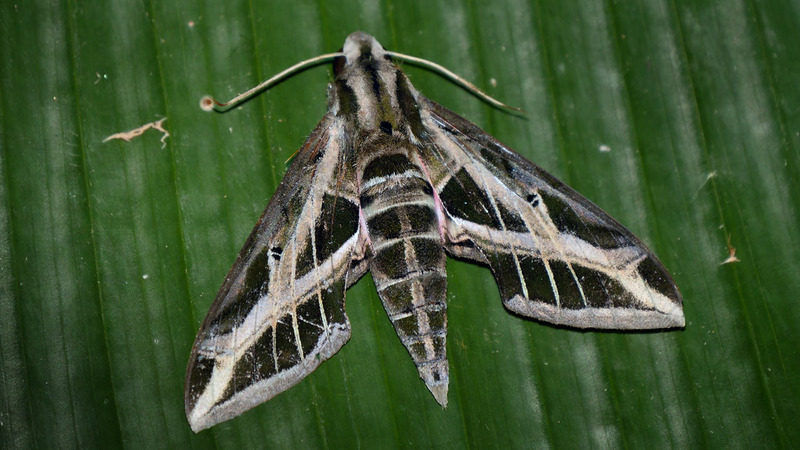 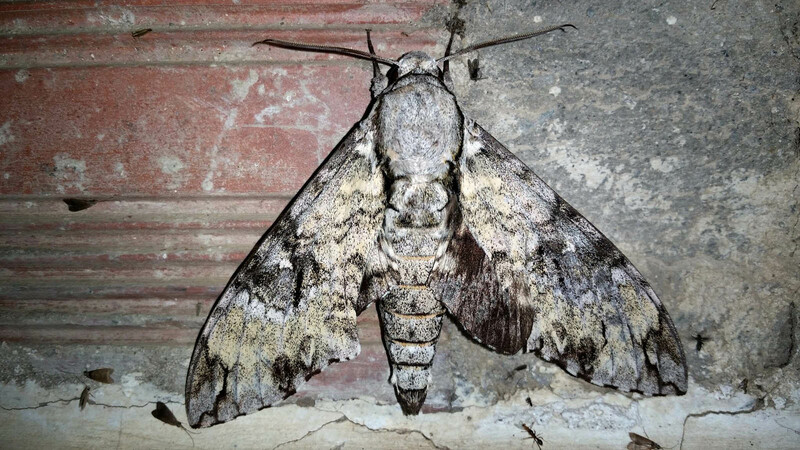 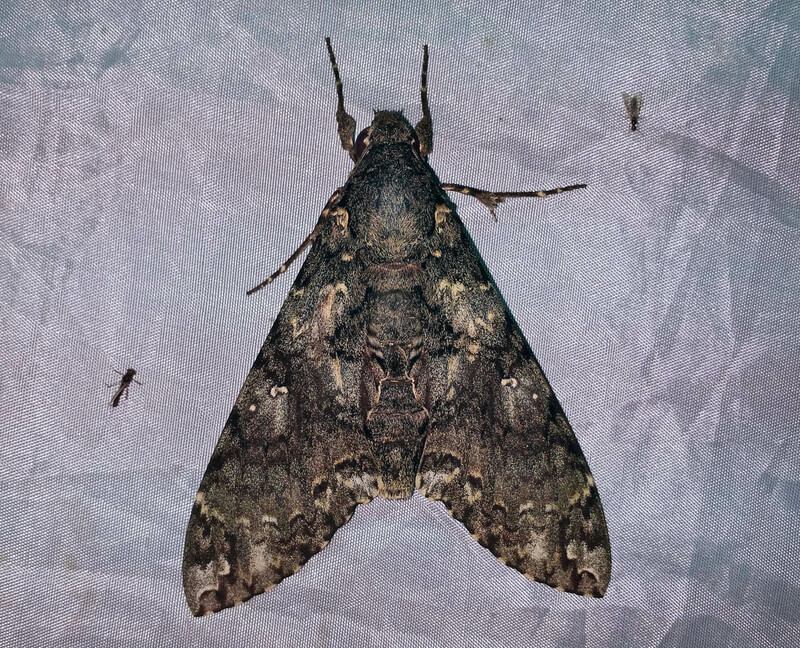 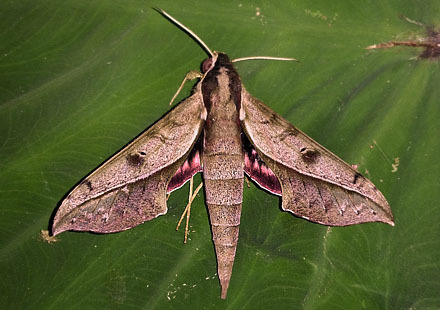 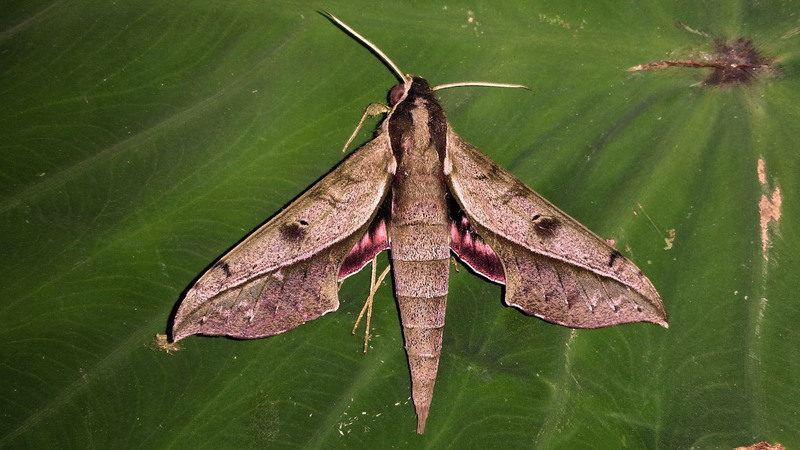 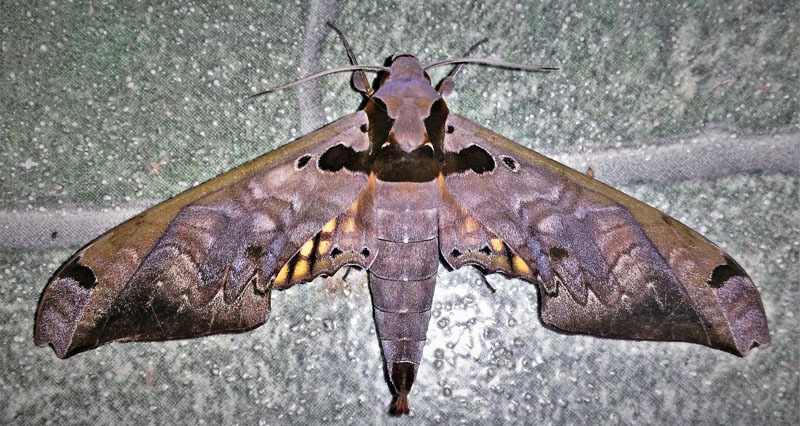 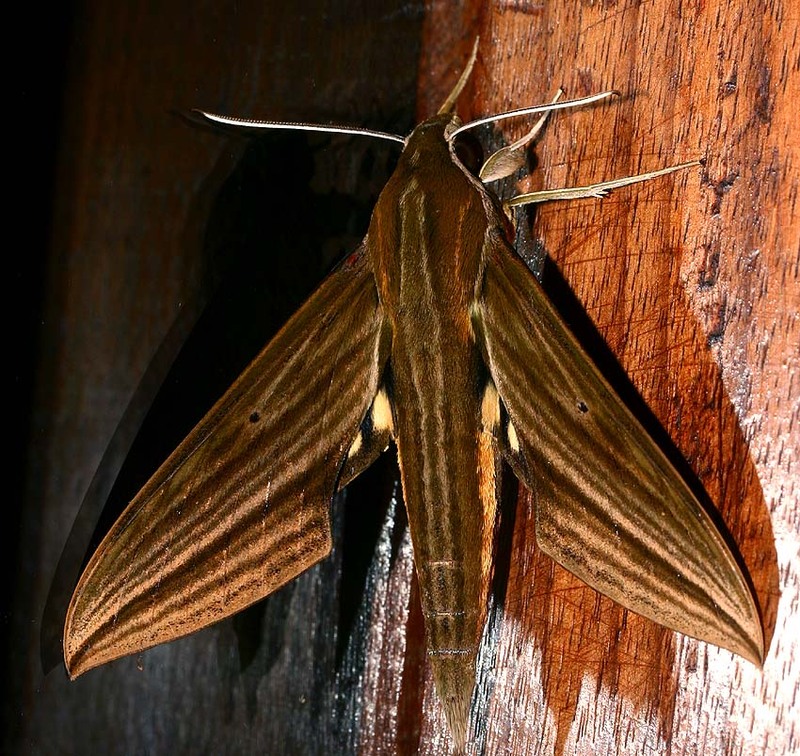 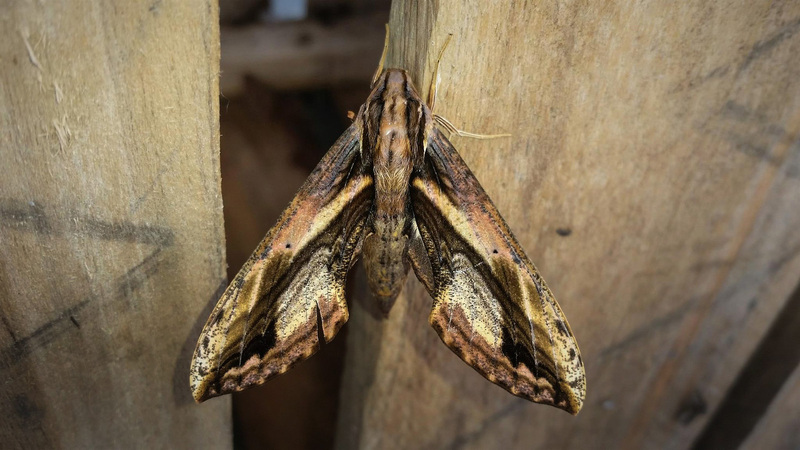 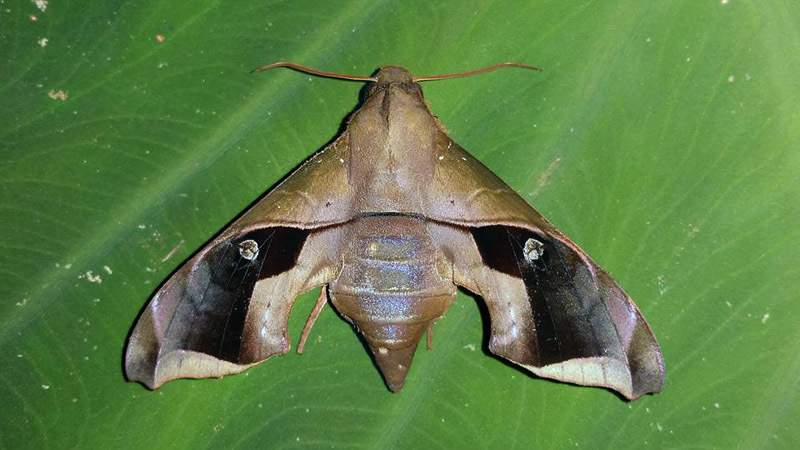 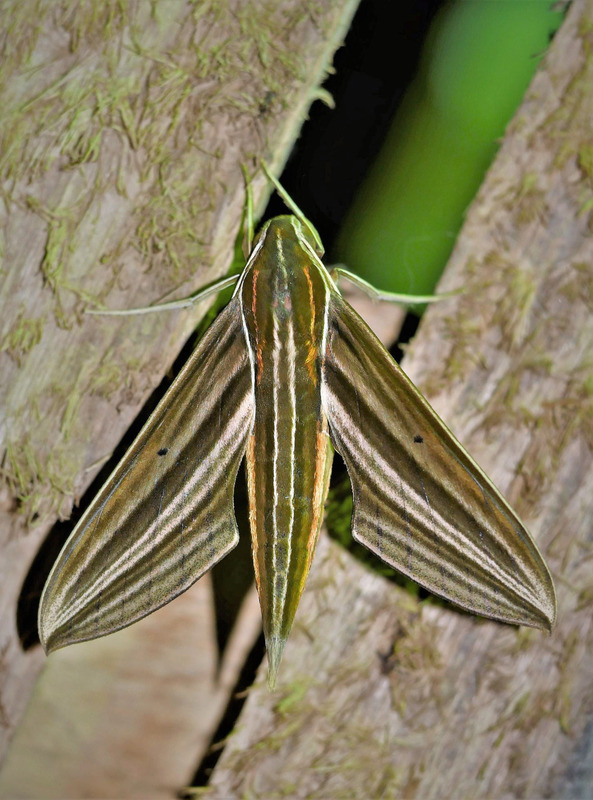 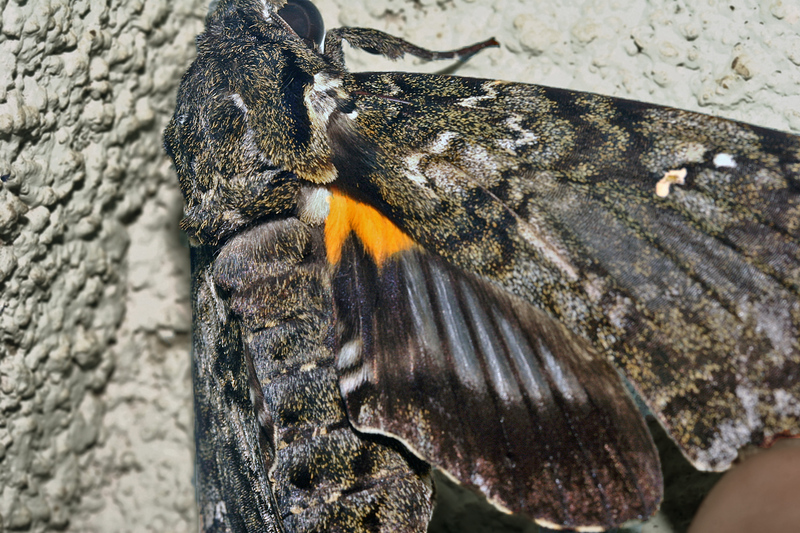 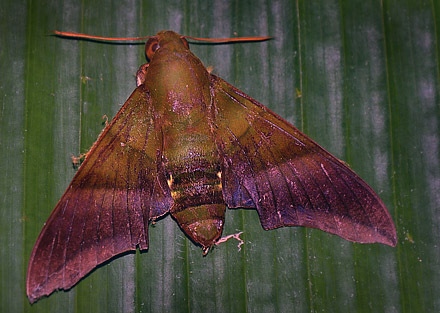 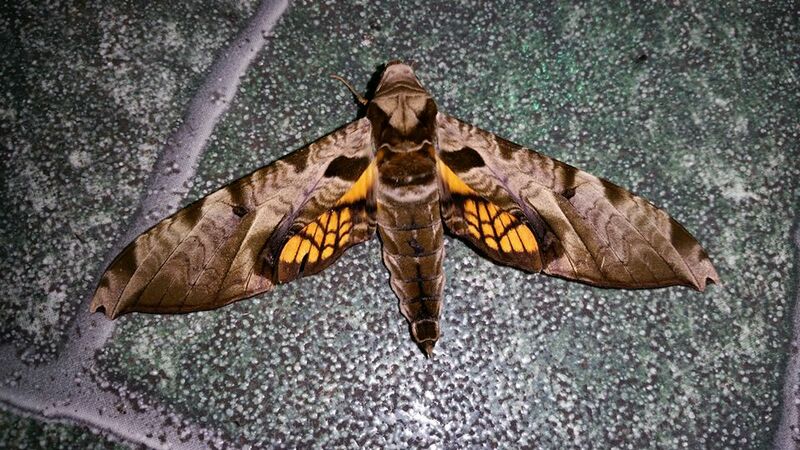 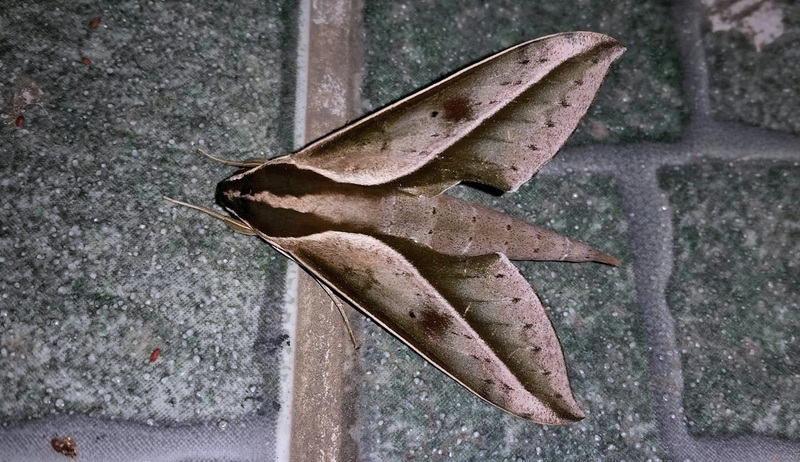 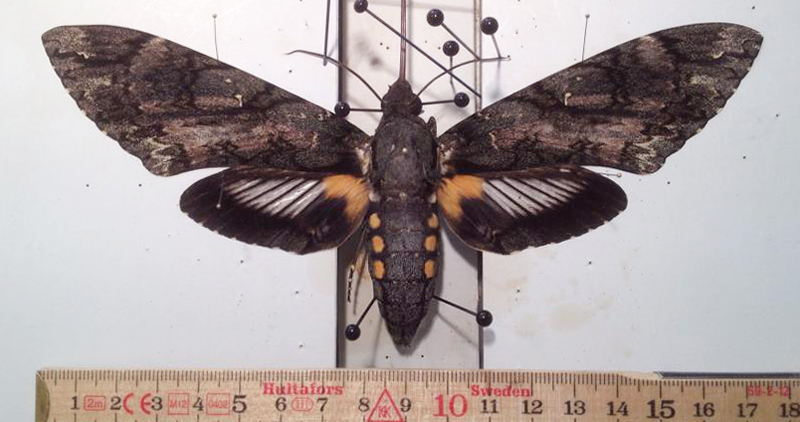 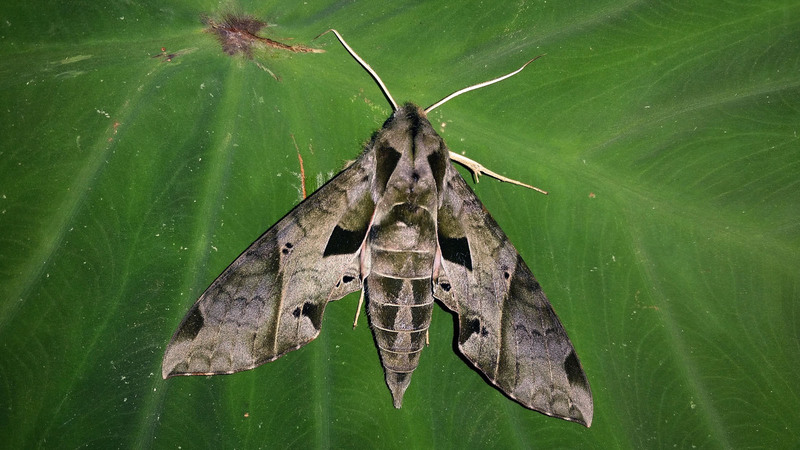 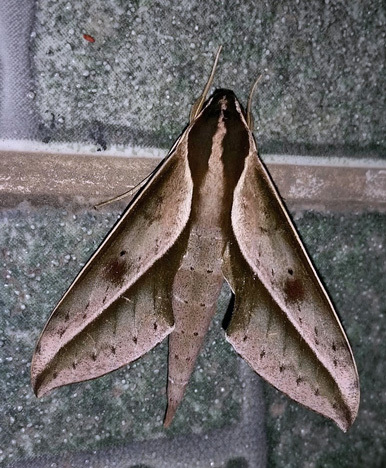 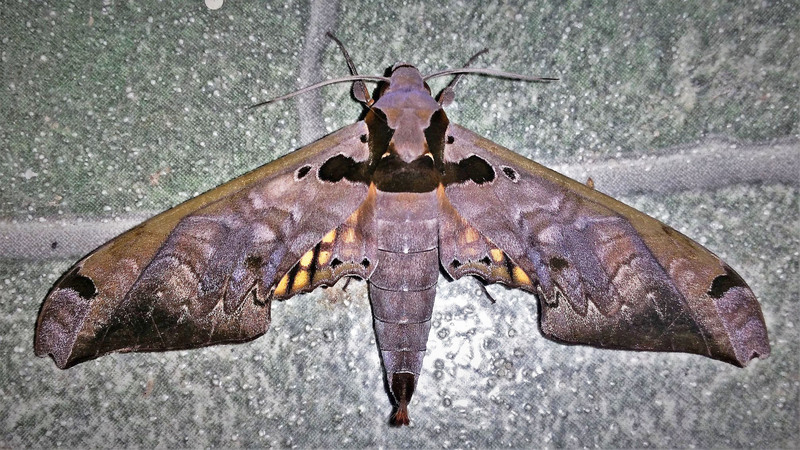 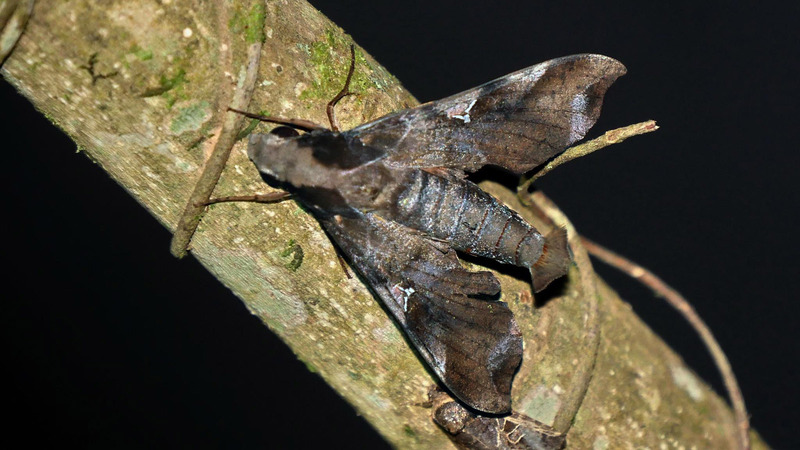 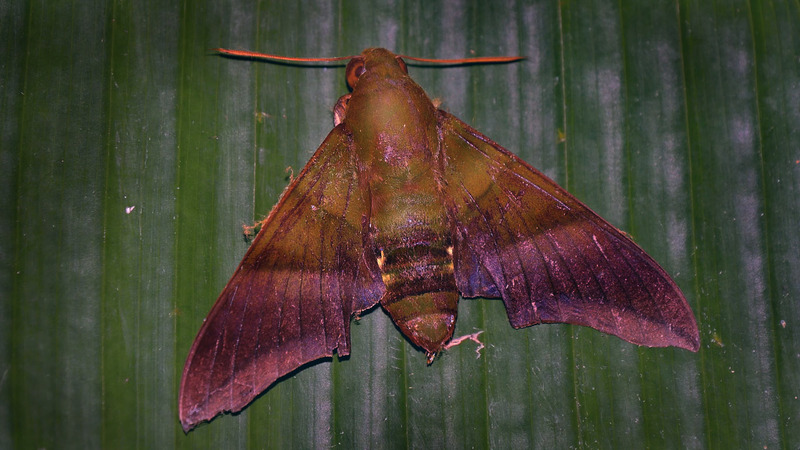 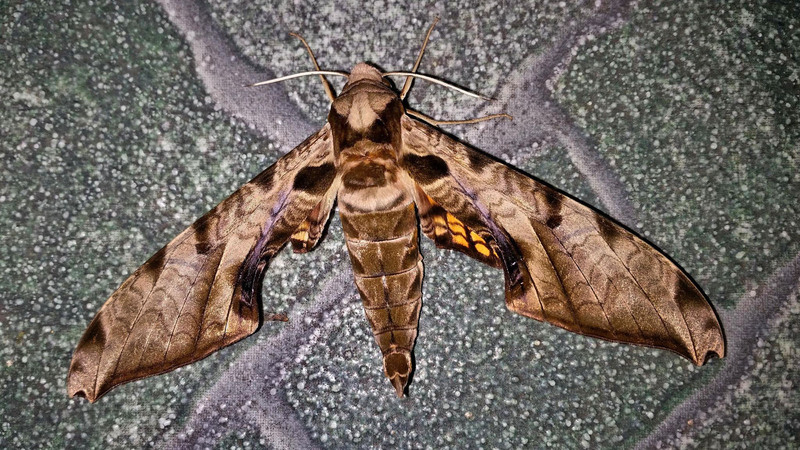 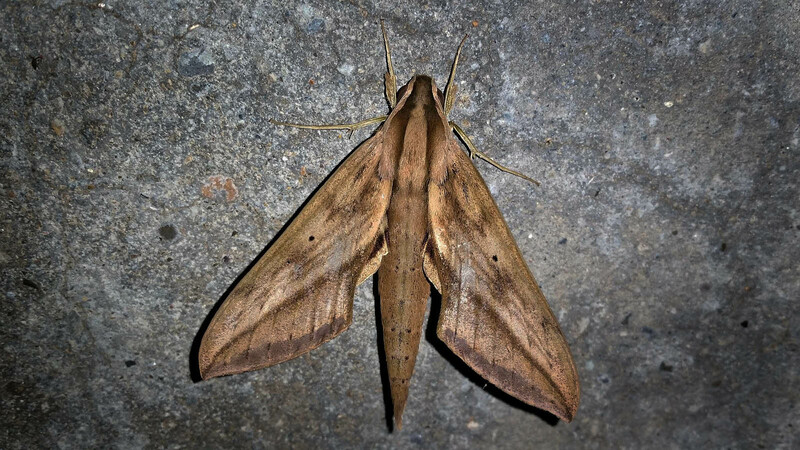 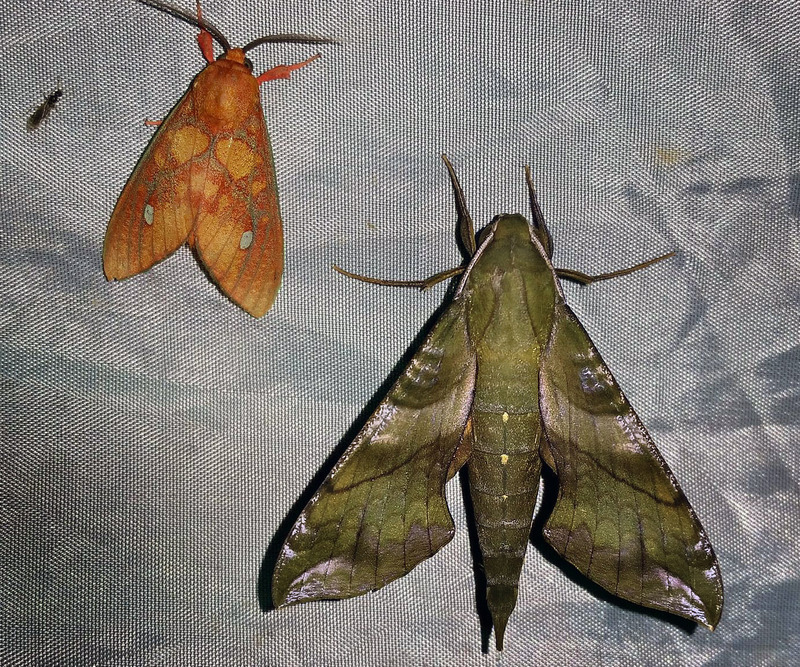 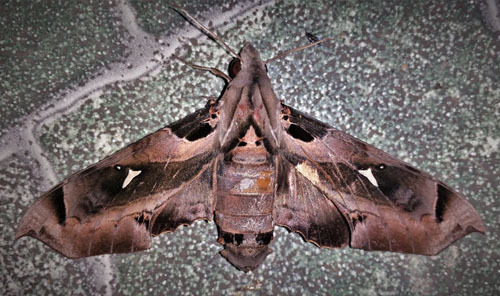 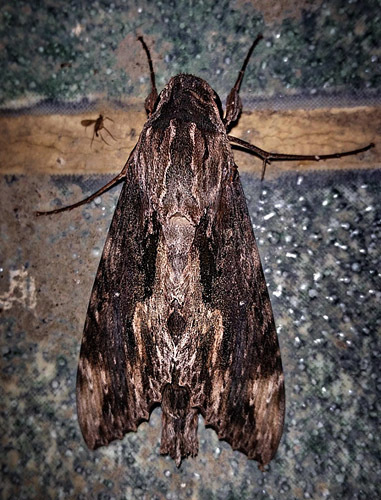 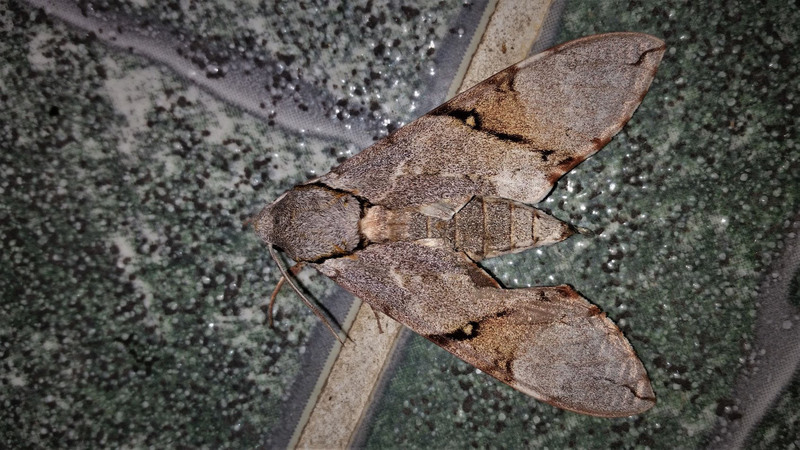 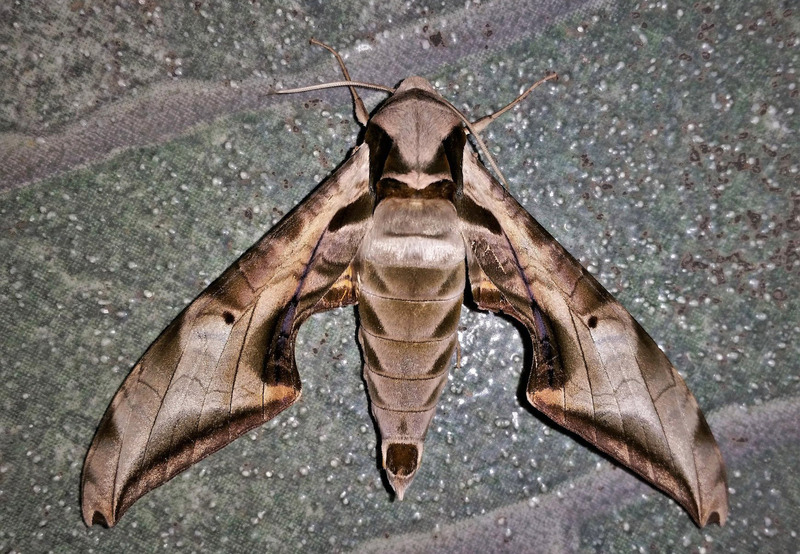 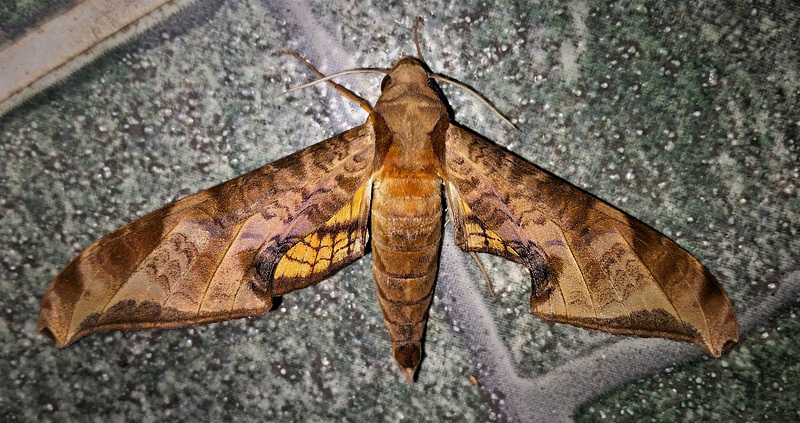 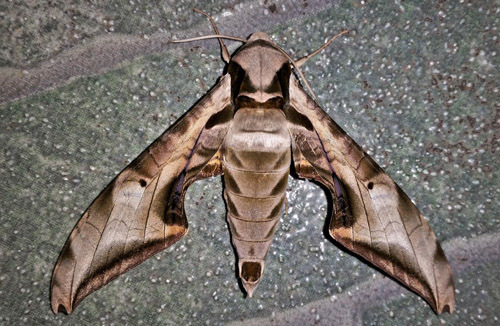 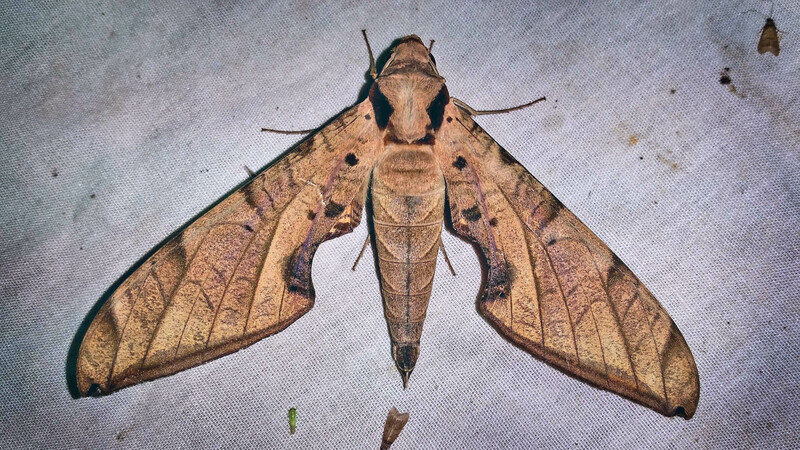 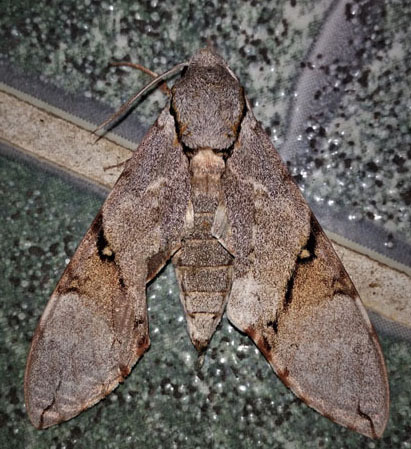 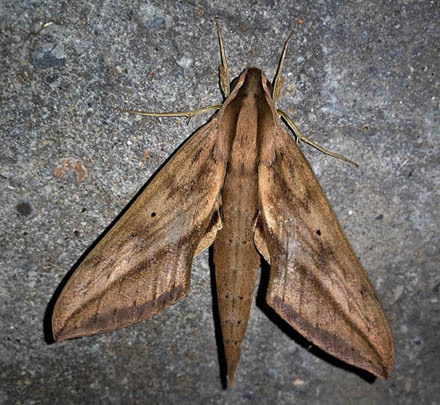 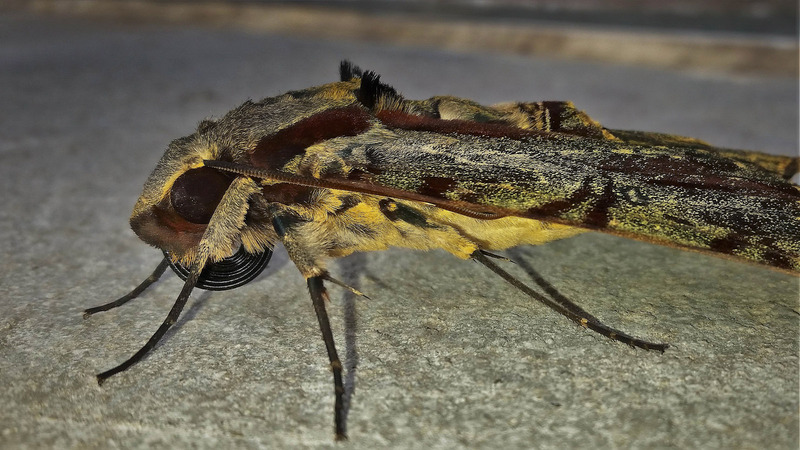 The proboscis of this hawk moth is long enough to reach the nectar receptacle of the orchid, which is between 20 and 35 cm (8 and 14 inches) in length. 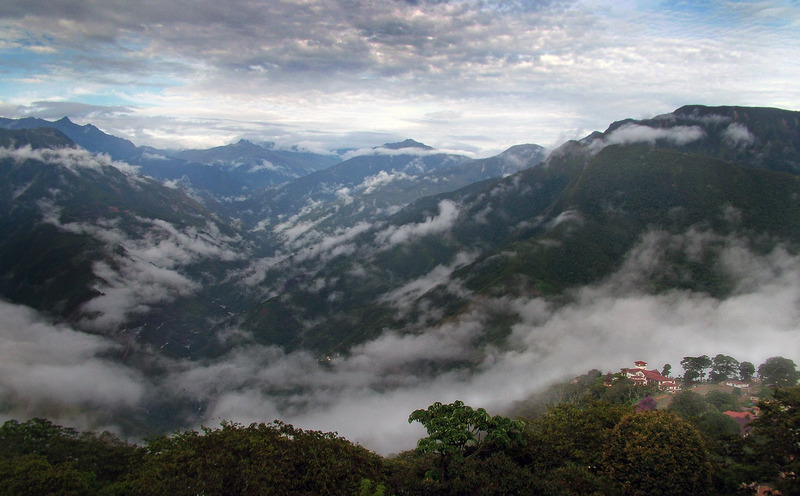 Caranavi, Yungas, Bolivia January 27, 2016. 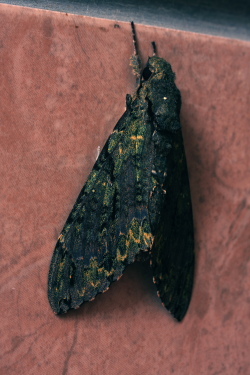 (Druce, 1881). 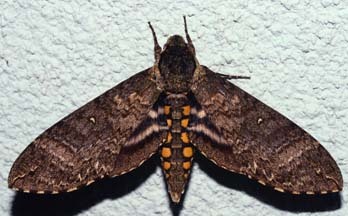 (Walker, 1856). 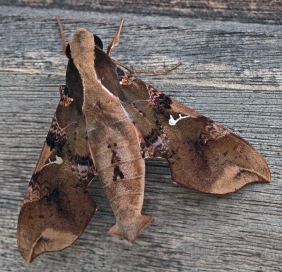 (Walker, 1856). 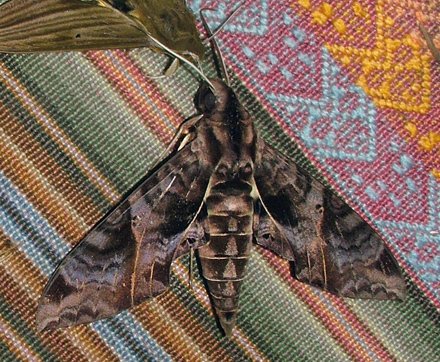 Caranavi, Yungas, Bolivia January 20, 2007. 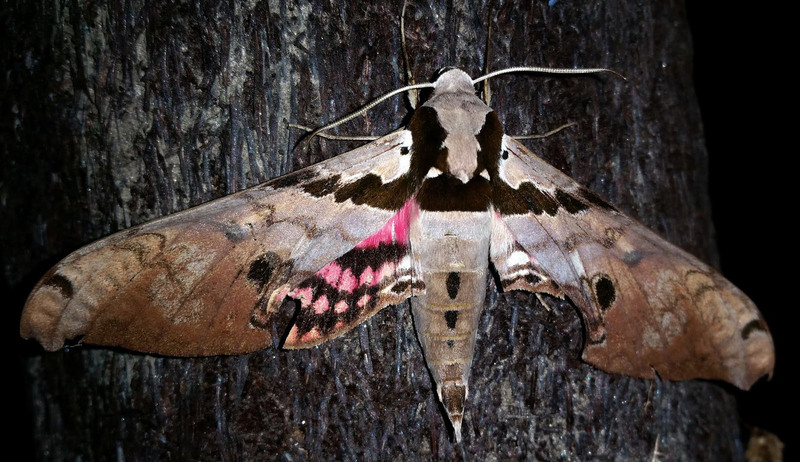 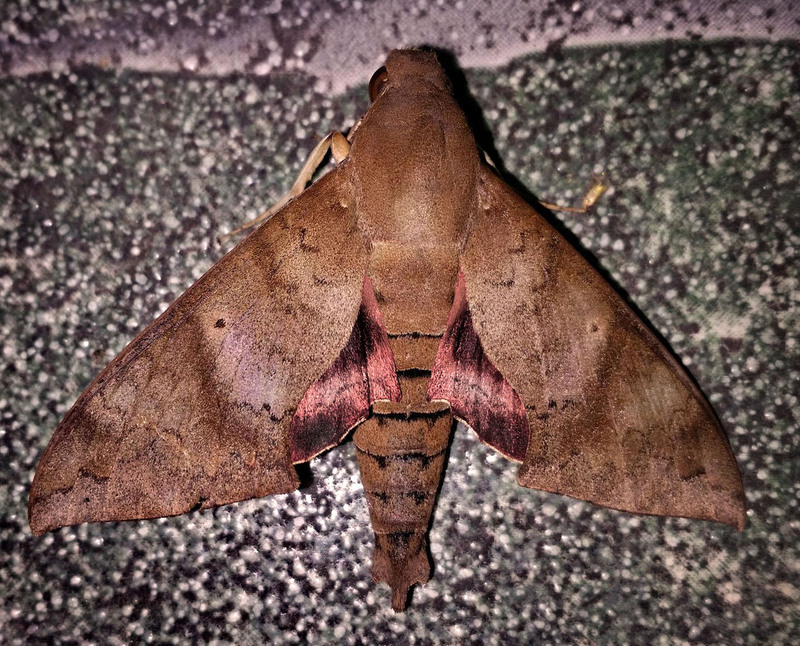 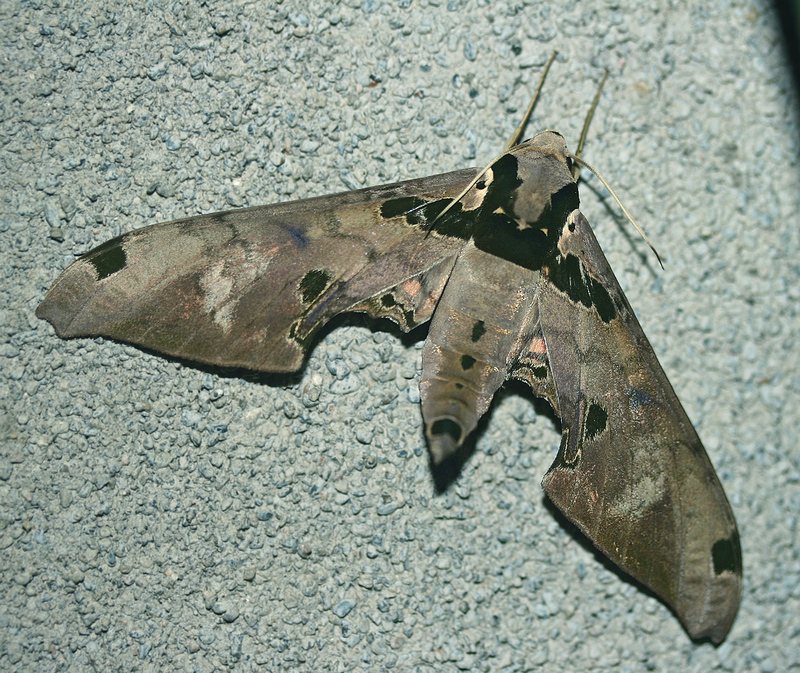 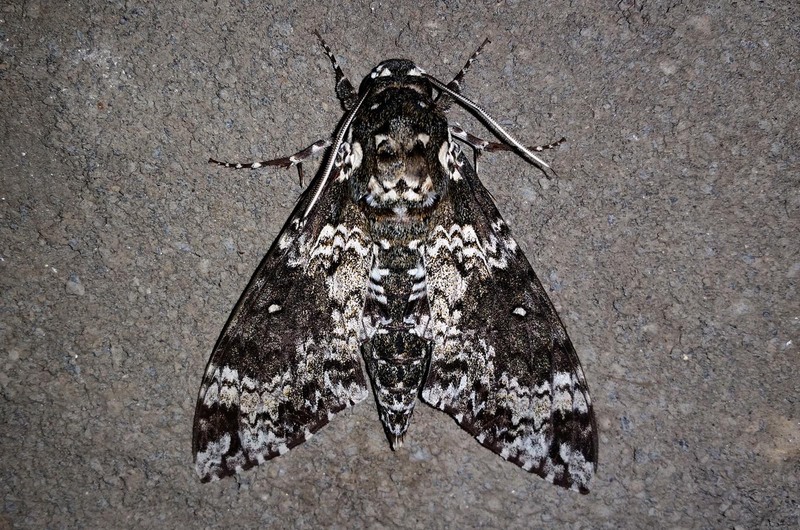 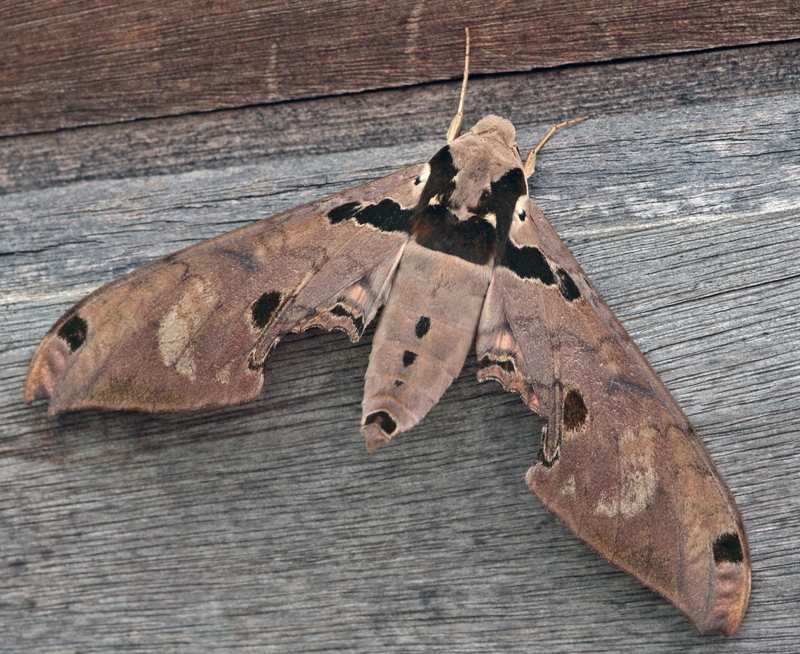 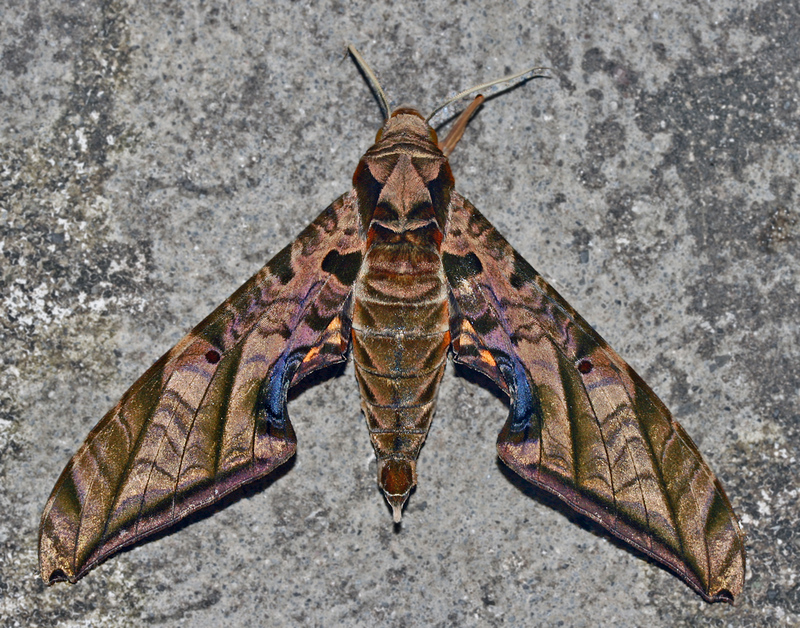 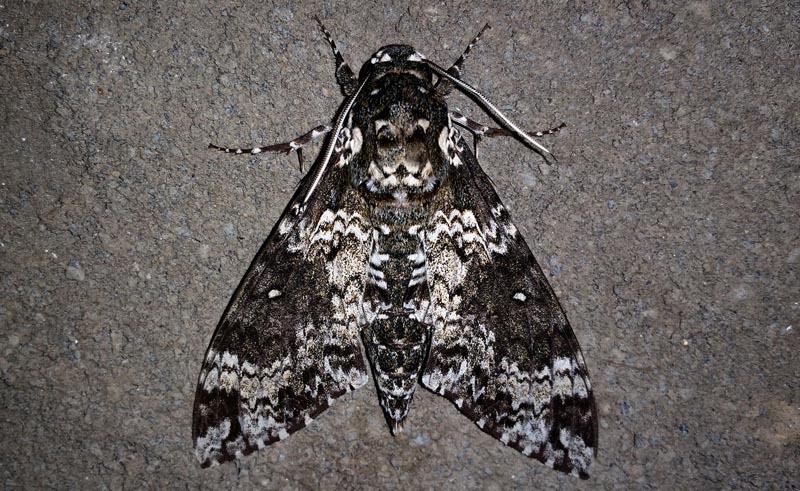 Gaudy Hawkmoth, Eumorpha capronnieri (Boisduval, 1875). 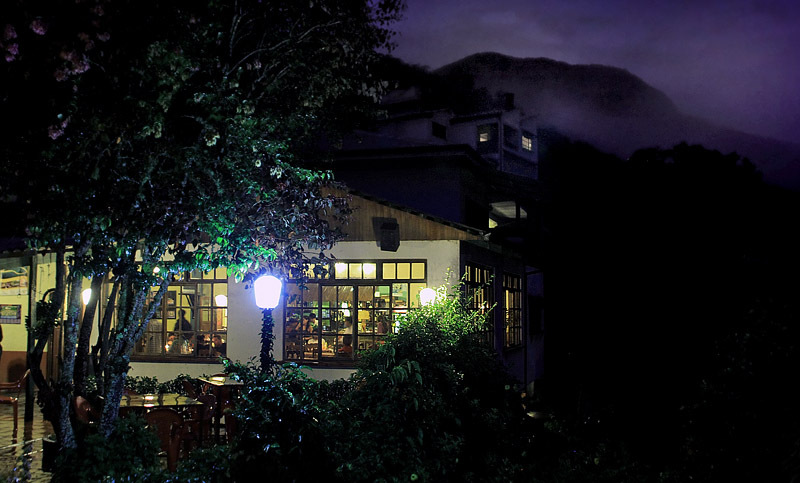 Caranavi, Yungas, Bolivia January 20, 2007 and February 17, 2016. 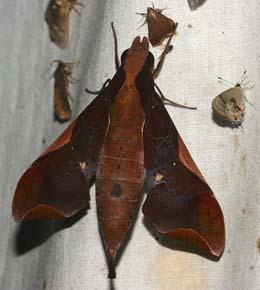 Pseudosphinx tetrio Erinnyis oenotrus male Erinnyis crameri. (Walker, 1856). 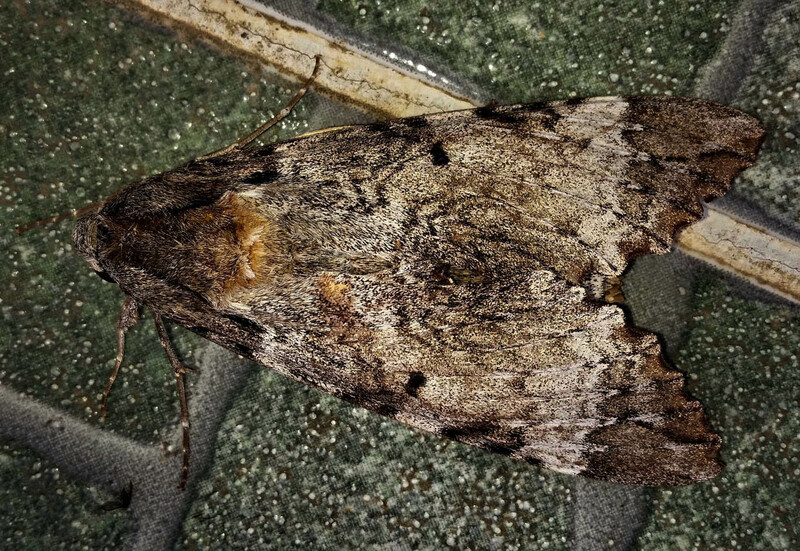 (Fabricius, 1775). 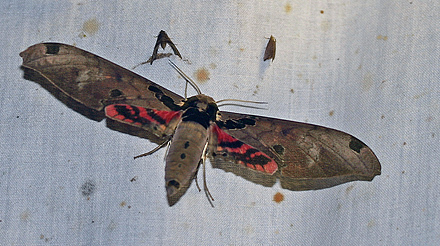 (Walker, 1856). 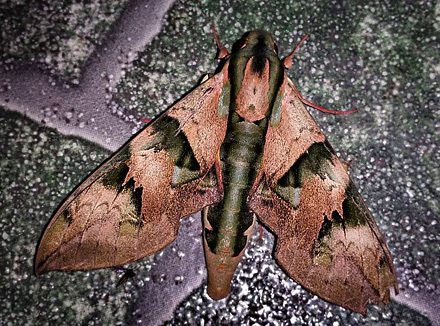 (Rothschild & Jordan, 1910). 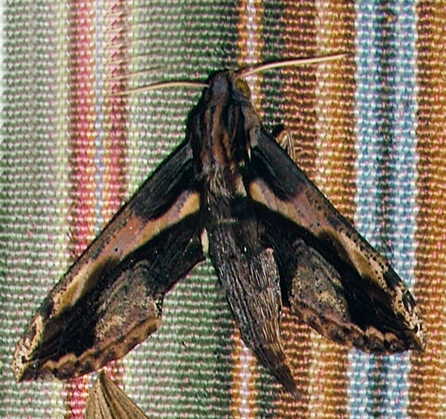 (Cramer, 1777). 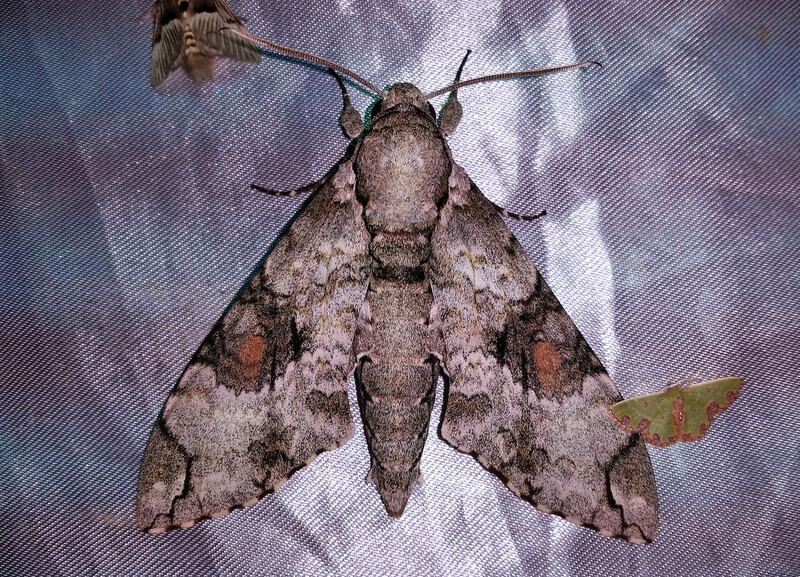 (Hübner, 1819), (Schaus, 1890). (Fabricius, 1777). 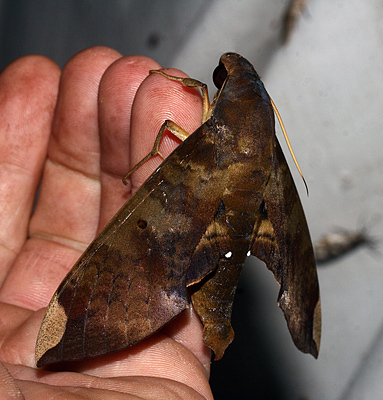 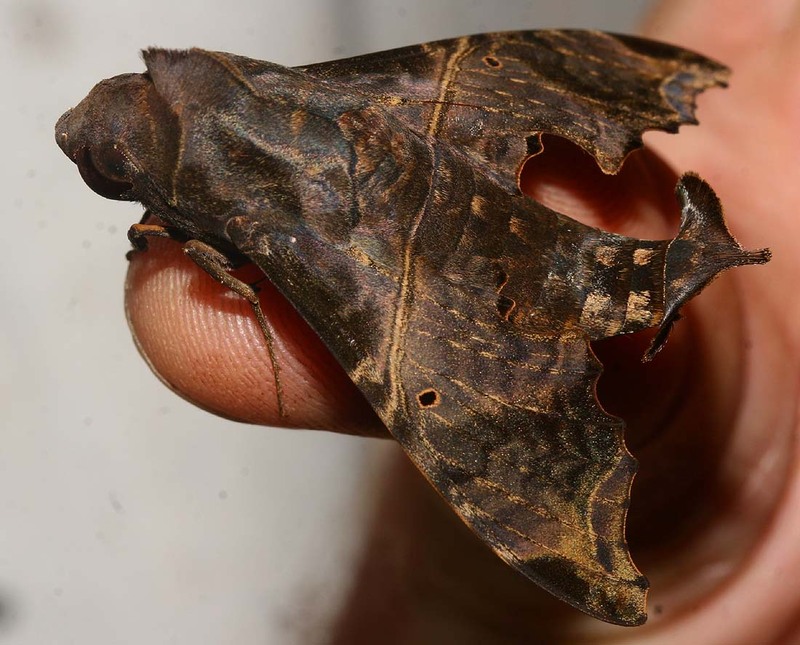 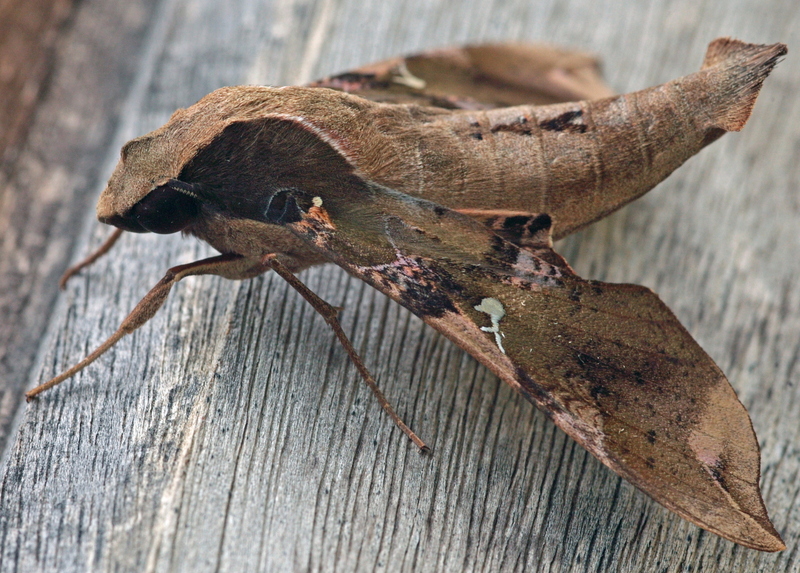 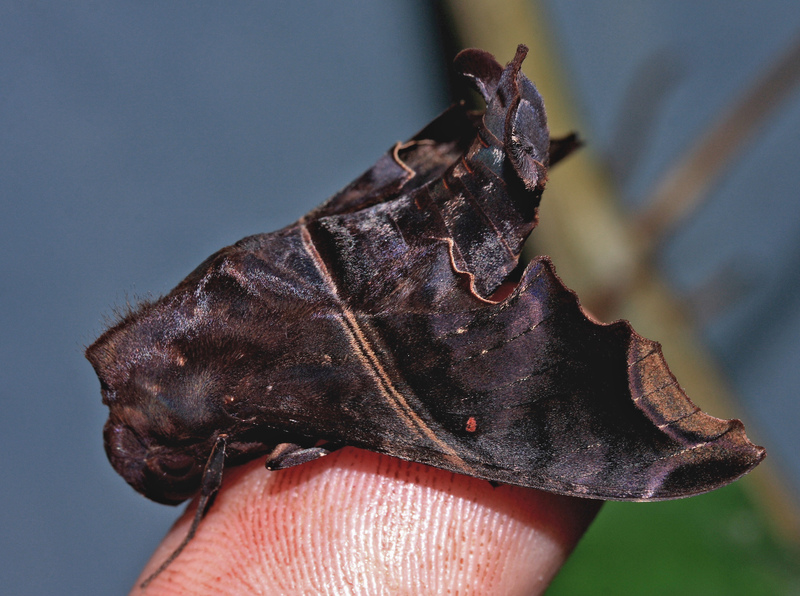 Snake Mimic Sphinx, Hemeroplanes triptolemus (Cramer, 1779). 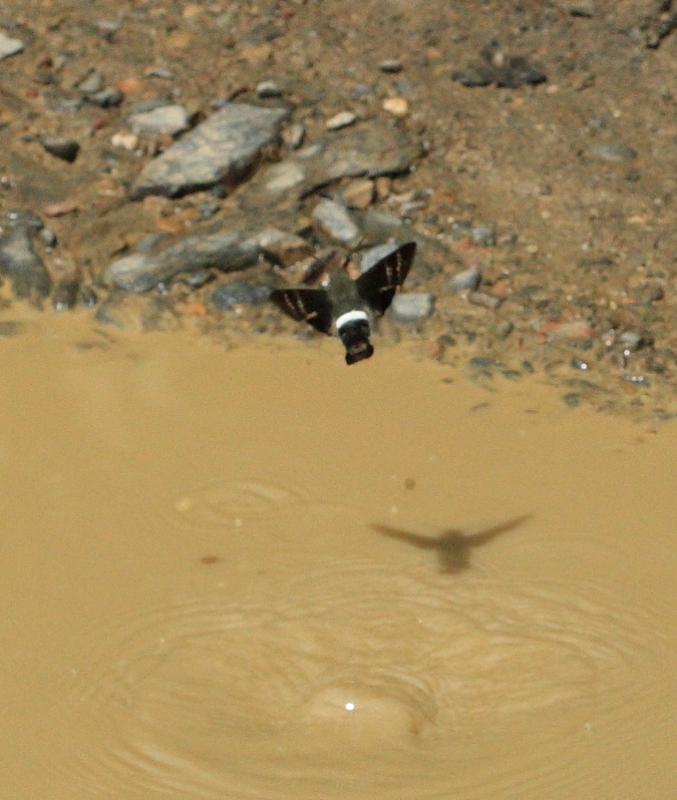 Consata, Yungas, Bolivia February 21, 2016. 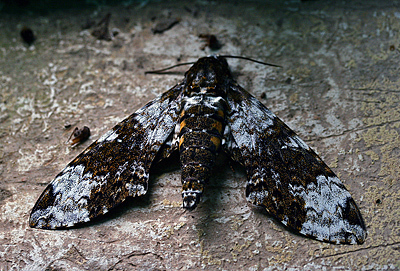 Photographer; Peter Møllmann. 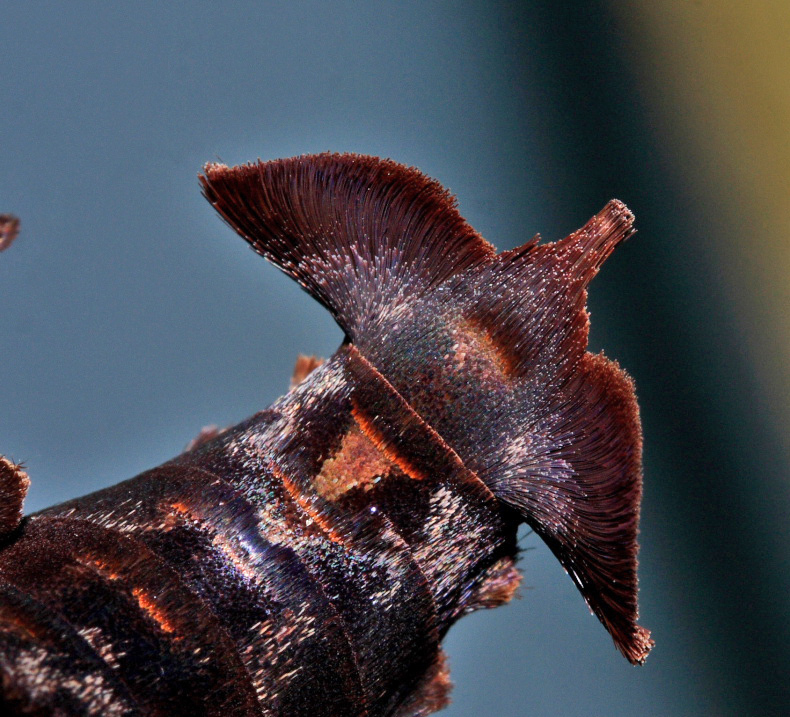 and Idification by Jean Haxaire on facebook. 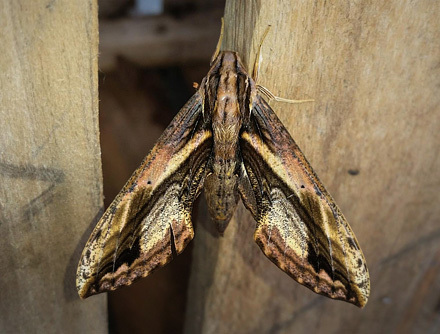 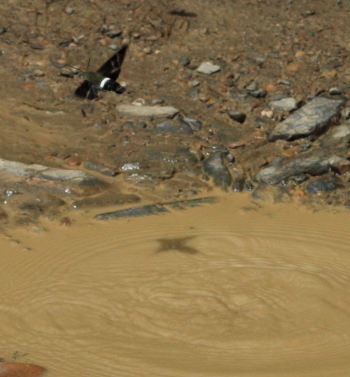 Snake Mimic Sphinx on Youtube. 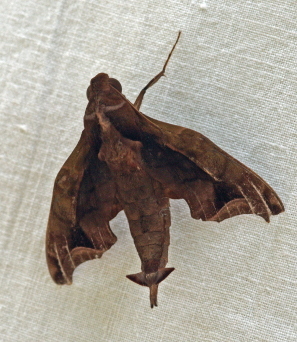 Oryba kadeni (Schaufuss, 1870) Oryba achemenides (Cramer, 1779) female. 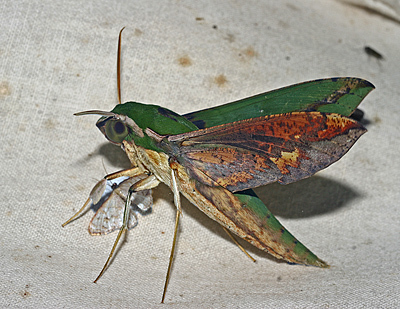 Oryba achemenides (Cramer, 1779) male. 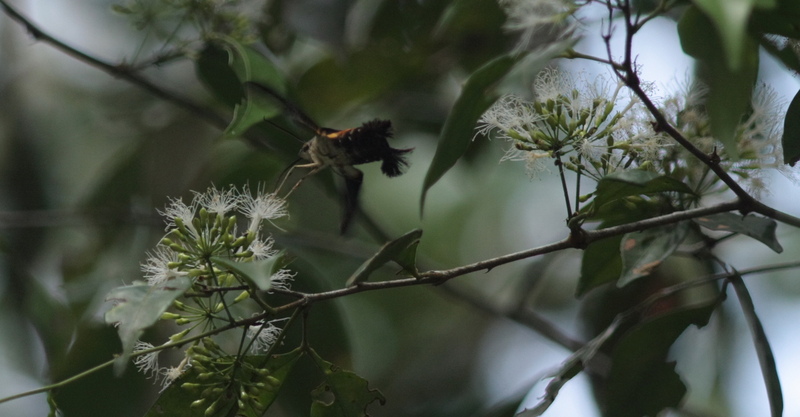 Caranavi, Yungas, Bolivia February 13, 2016. 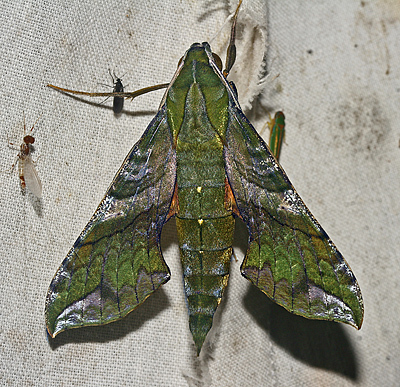 Caranavi, Yungas, Bolivia February 14, 2016. 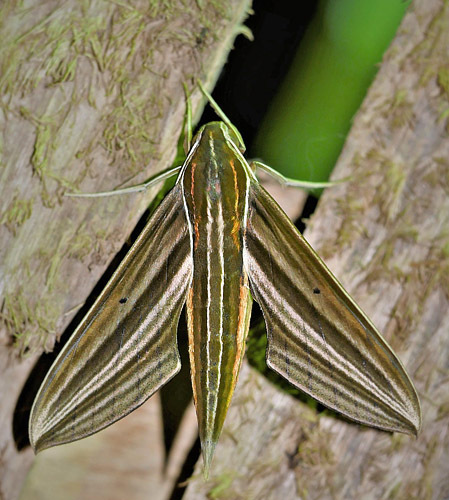 Caranavi, Yungas, Bolivia January 30 , 2016. 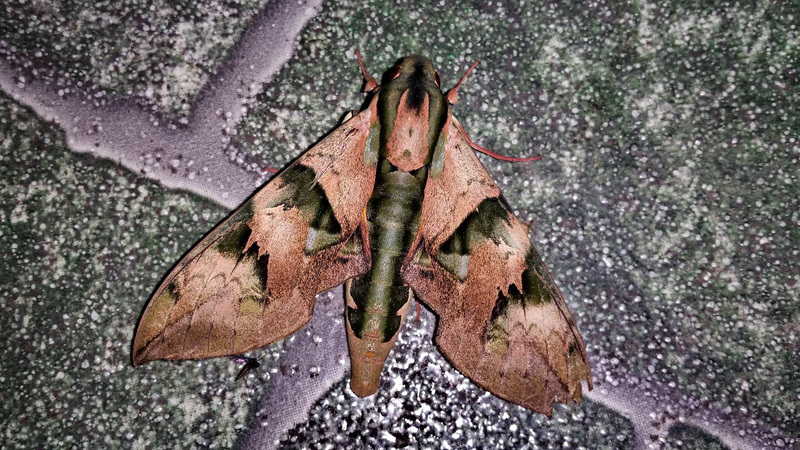 (Rothschild & Jordan, 1906). 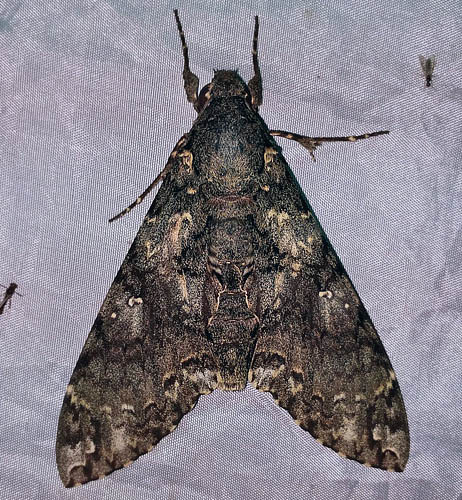 (Stoll, 1782). 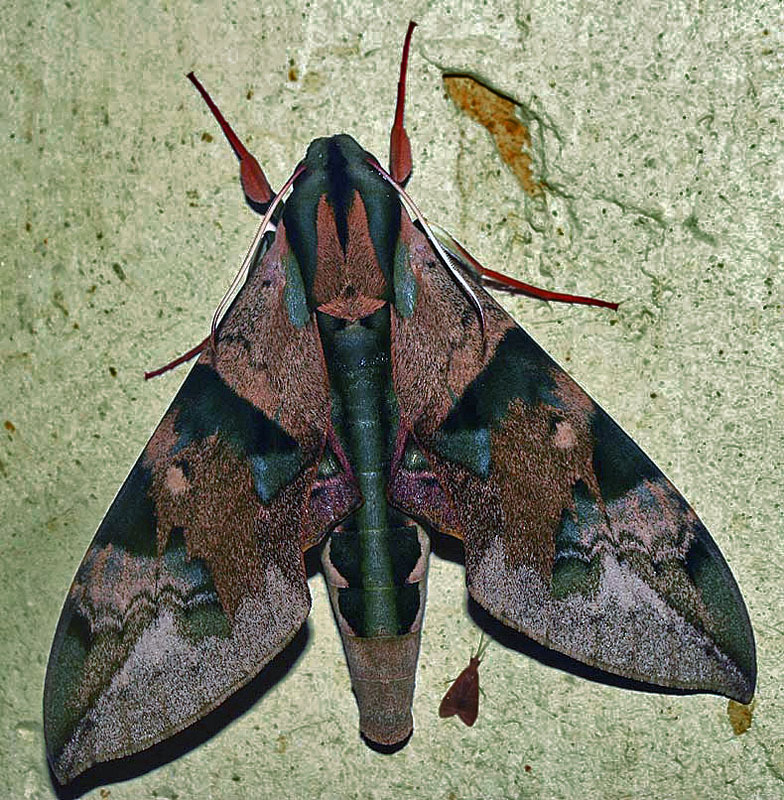 (Fabricius, 1777). 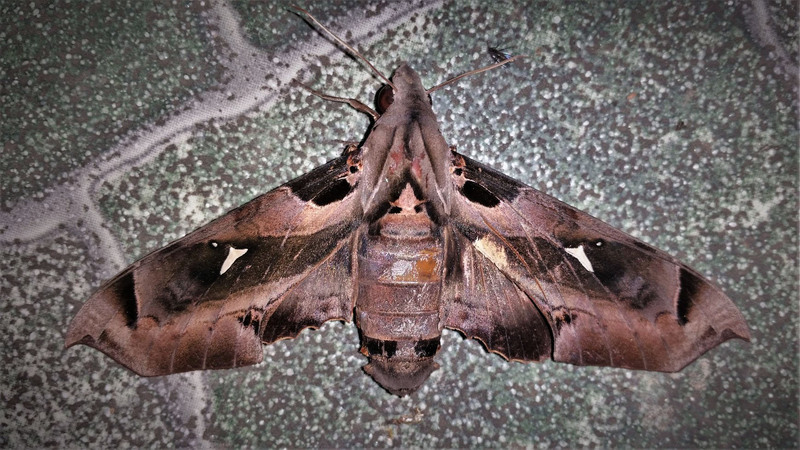 (Fabricius, 1777). 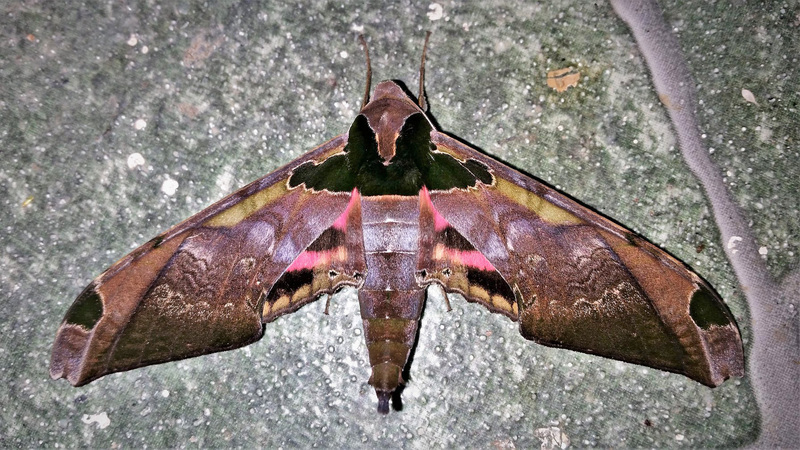 Caranavi, Yungas, Bolivia december 7, 2018. 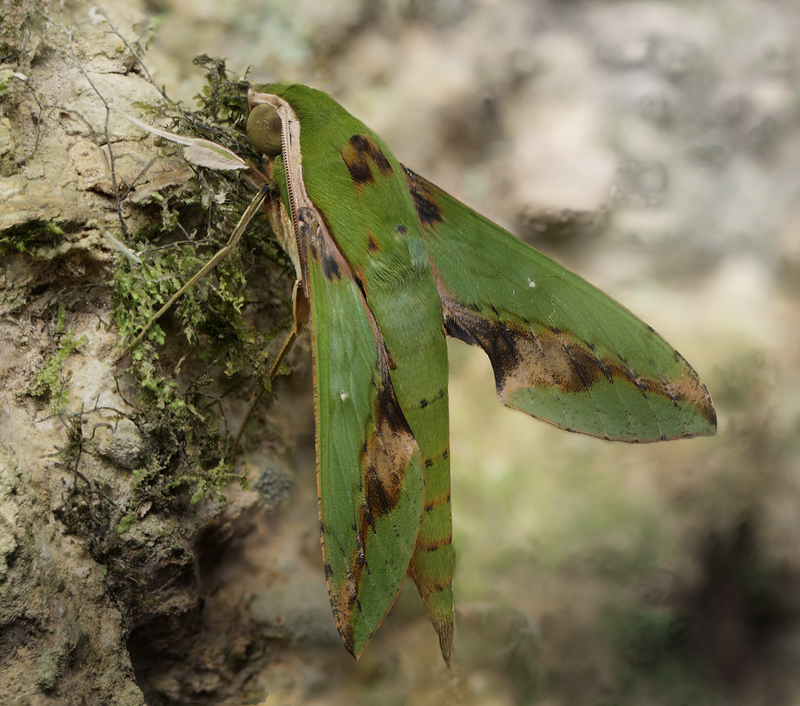 Xylophanes ceratomioides (Grote & Robinson, 1867). 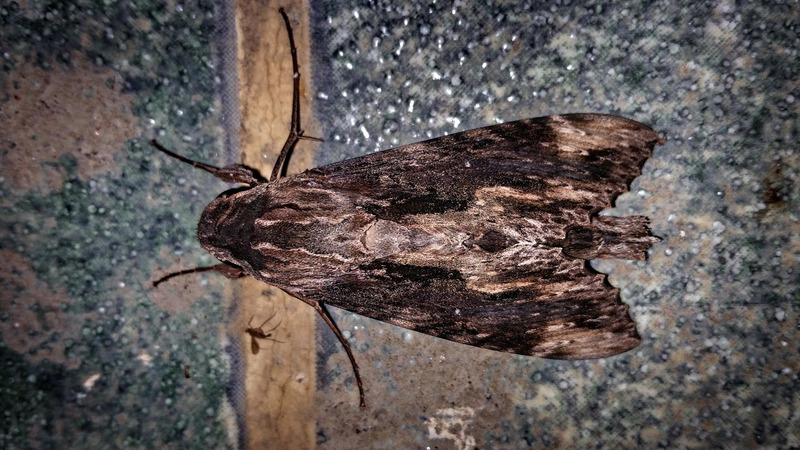 Xylophanes ceratomioides (Grote & Robinson, 1867). Coroico, Yungas, Bolivia January 27, 2016. 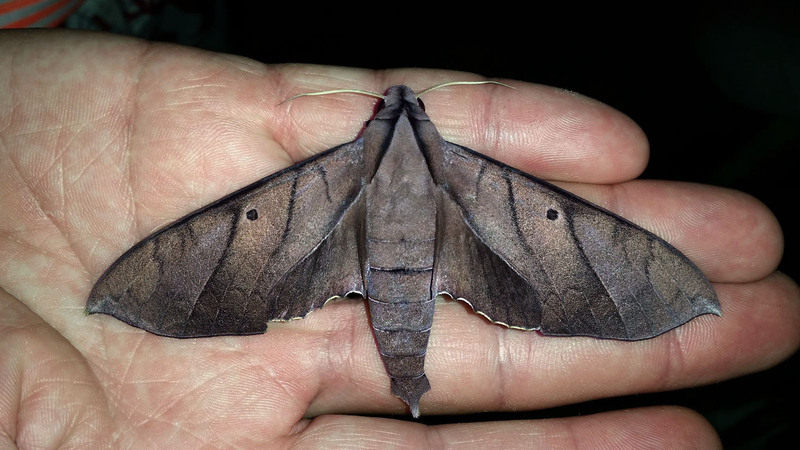 Caranavi, Yungas, Bolivia January 26, 2017. 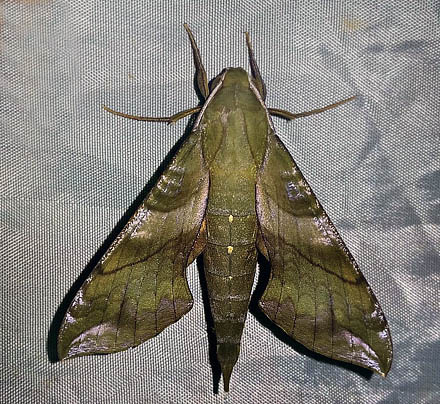 Caranavi, Yungas, Bolivia January 19, 2017. 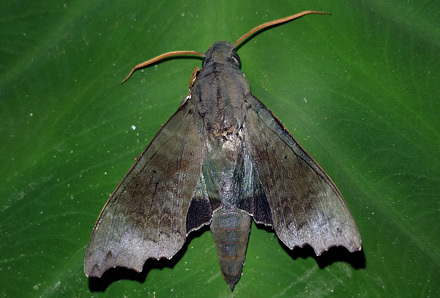 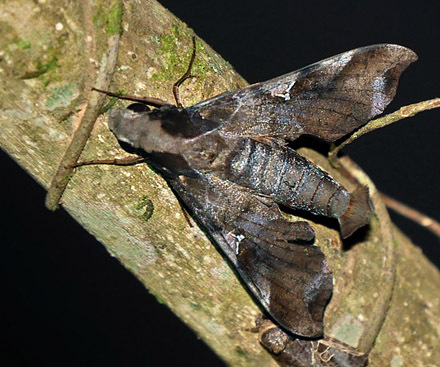 A drinking small hawkmoths; Aellopos ceculus / syn. 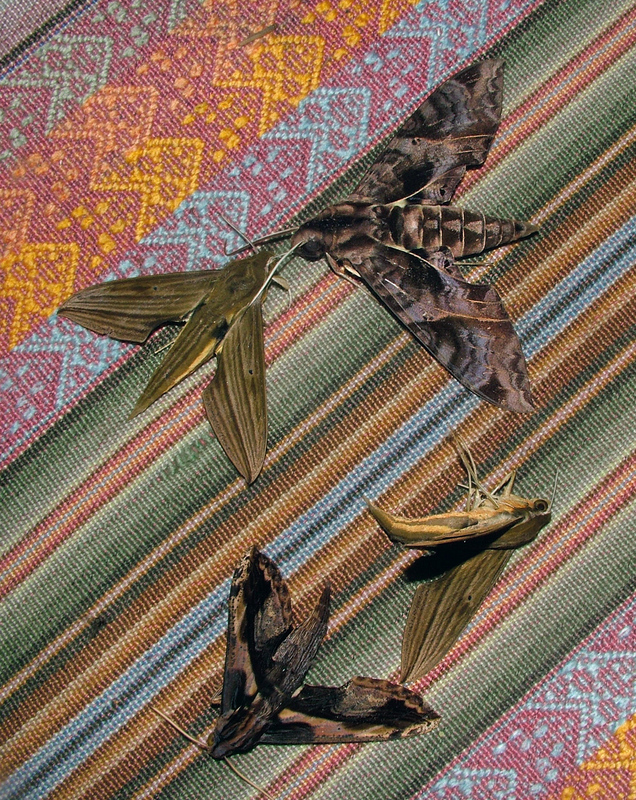 gehleni and Fadus Sphinx, Aellopos fadus from Bolivia. 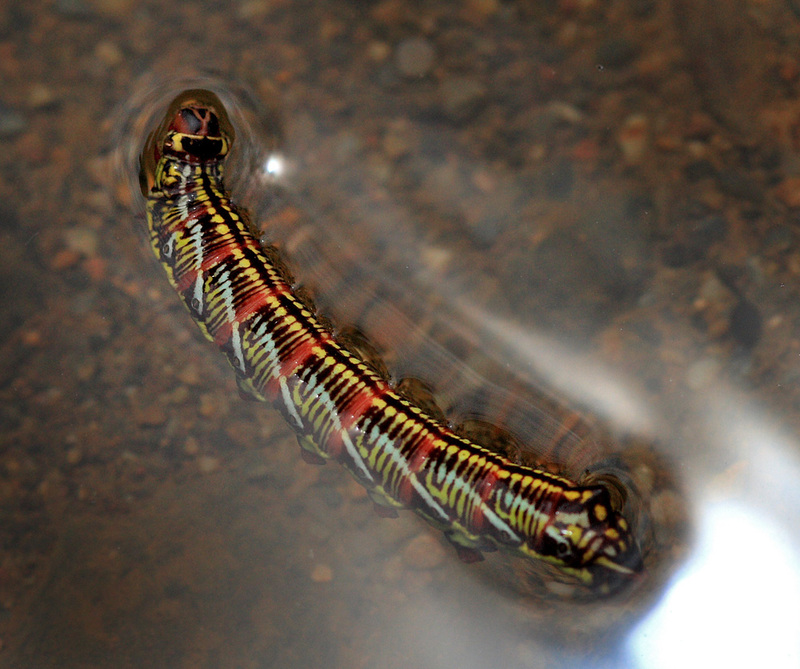 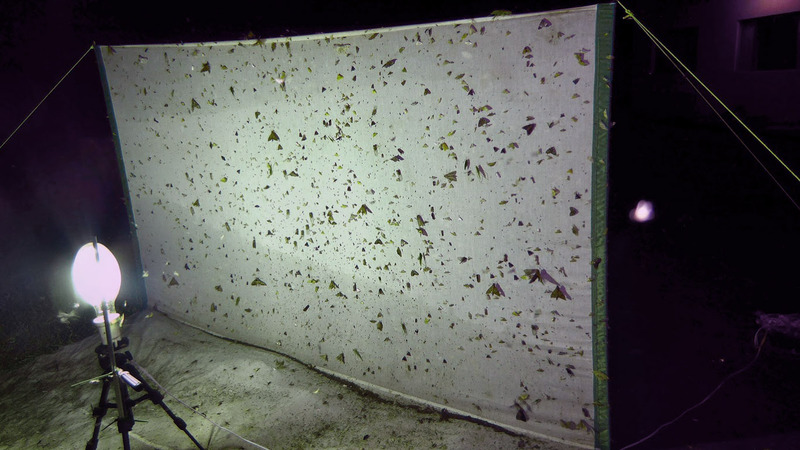 Sometime the Aellopos species go a longer swim underwater.